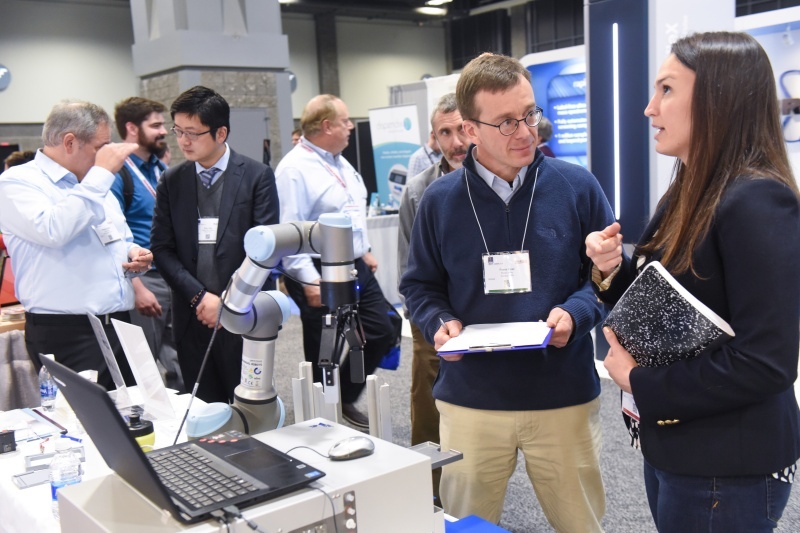 SLAS2017, the Society’s sixth annual flagship international conference and exhibition, attracted 5,050 participants to Washington, DC, from February 4-8. 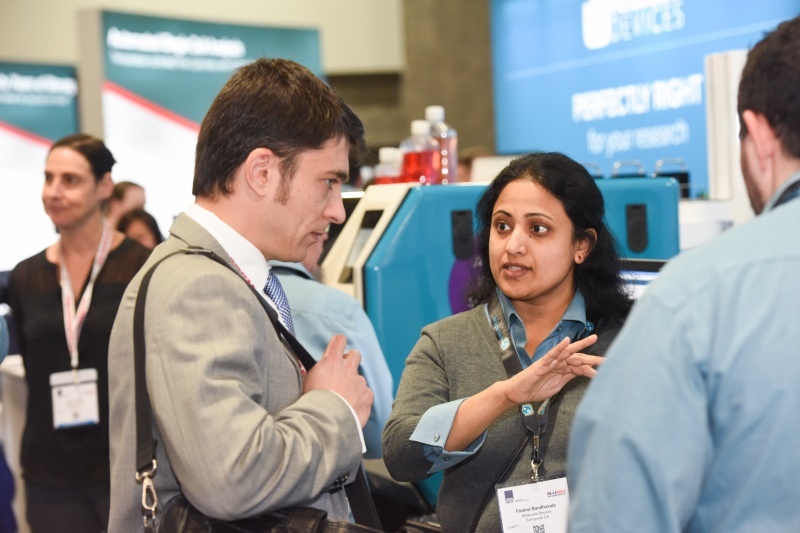 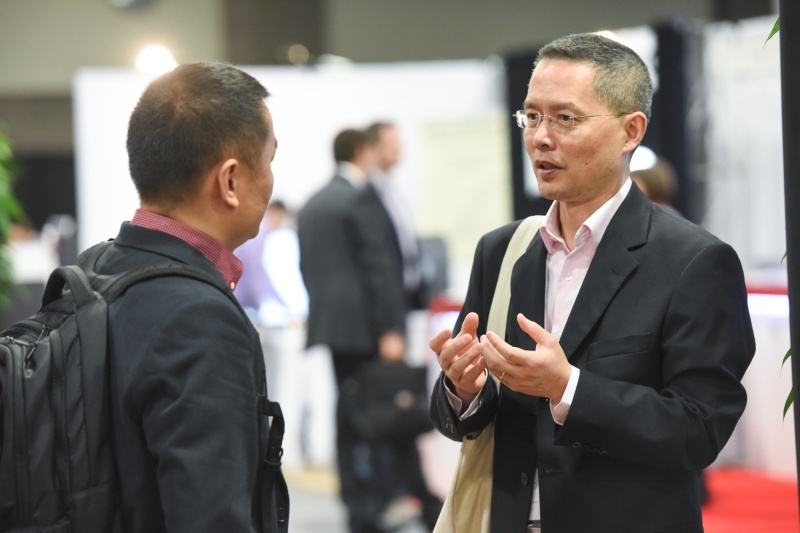 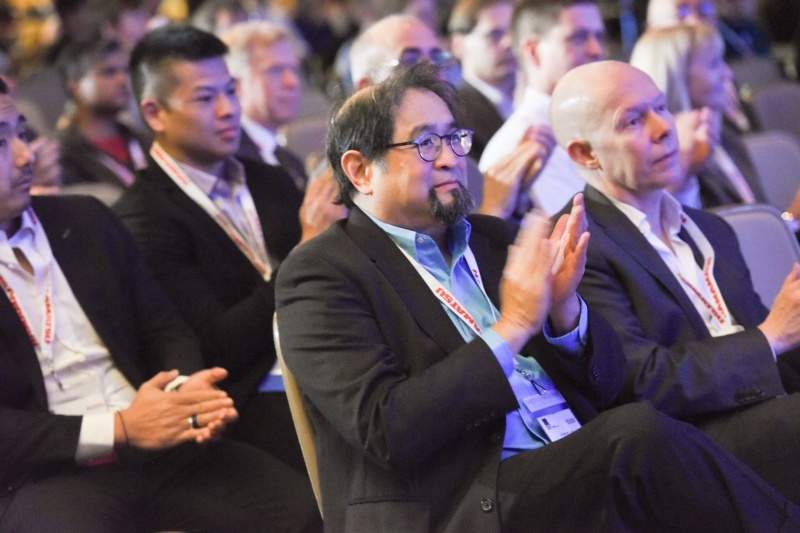 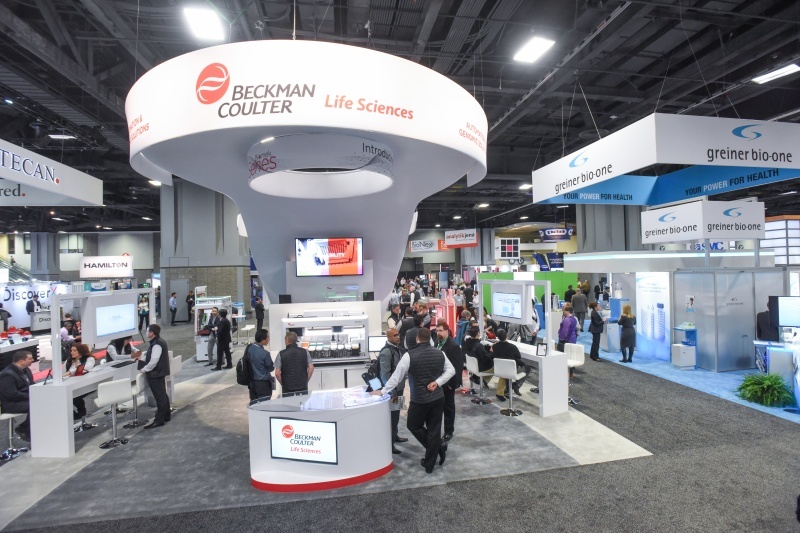 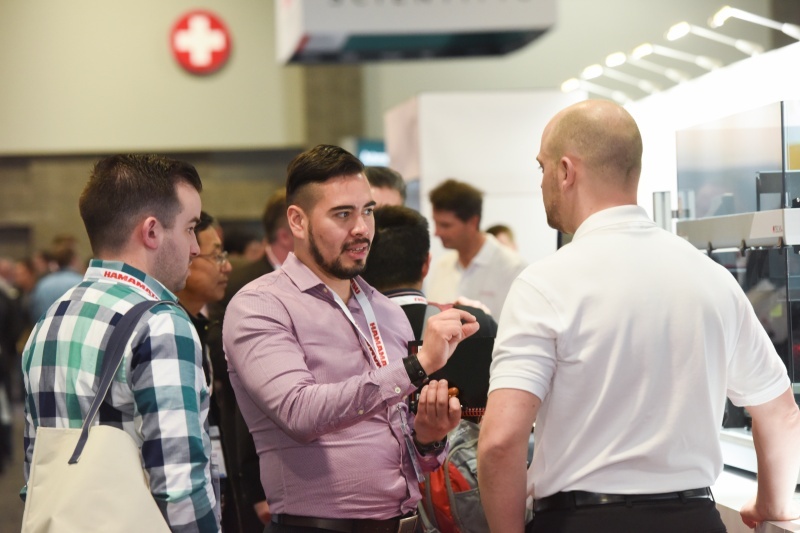 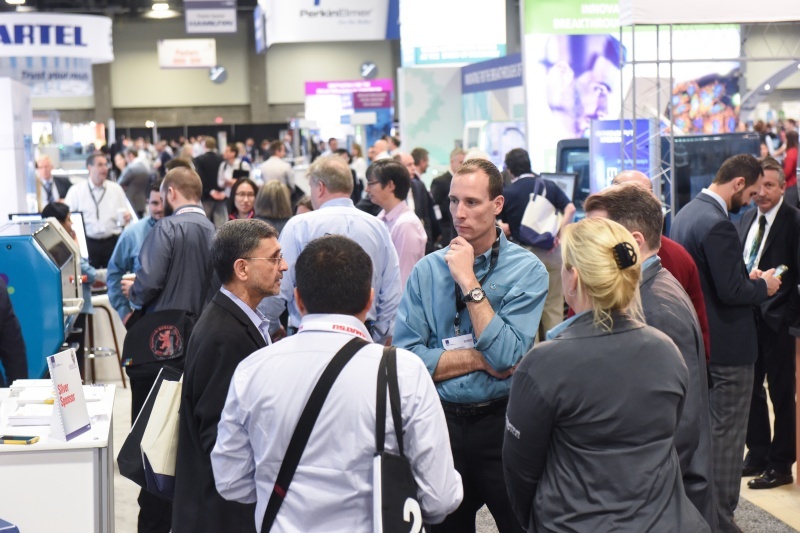 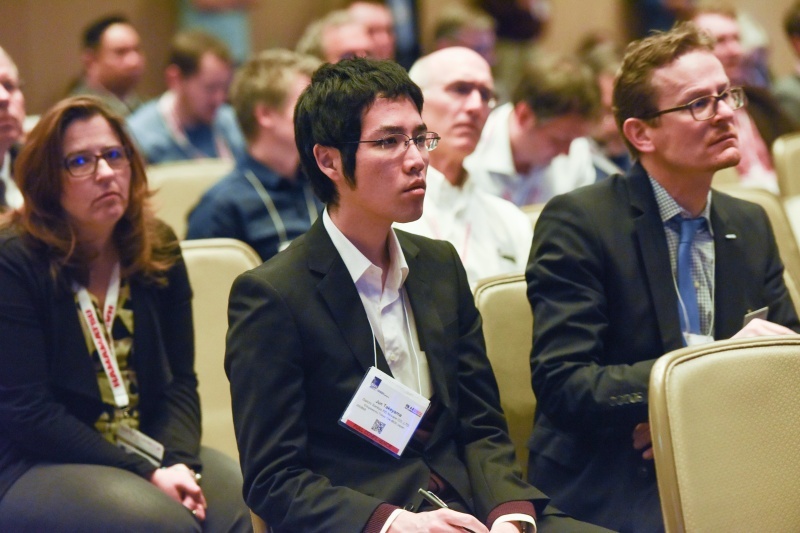 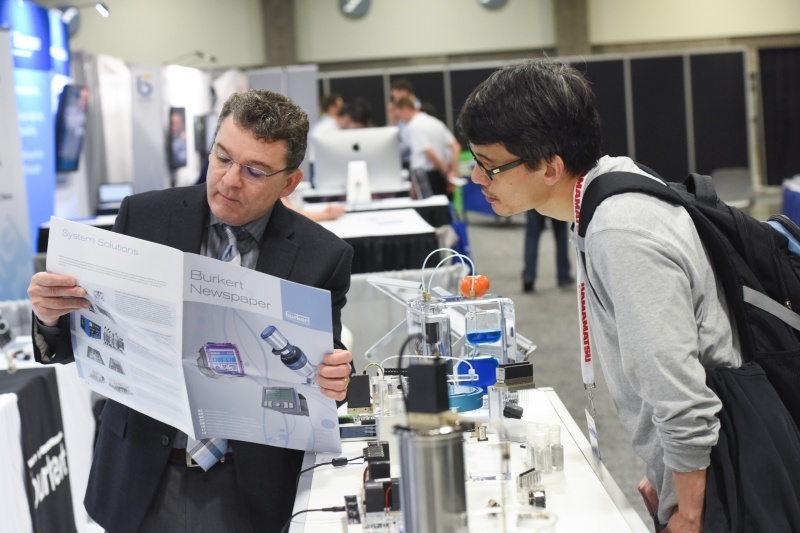 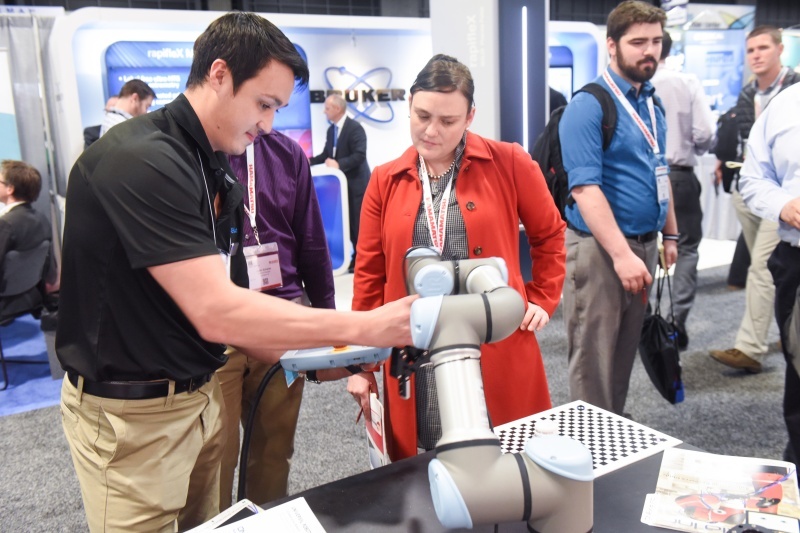 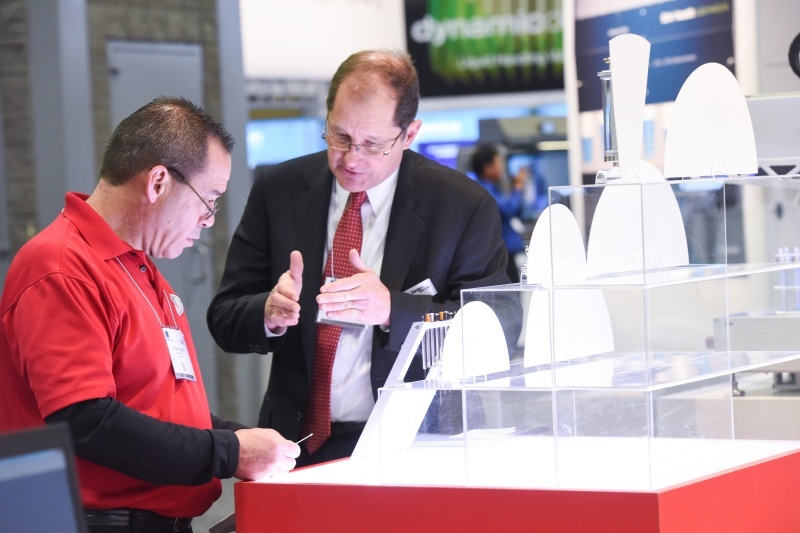 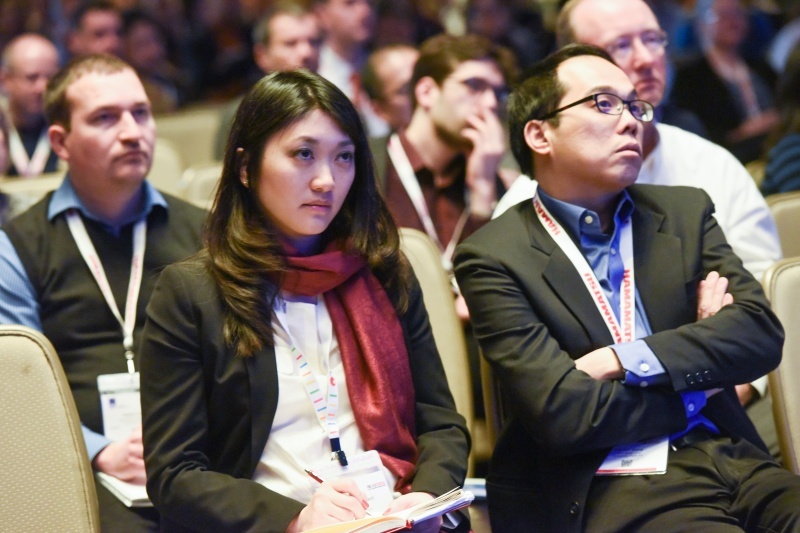 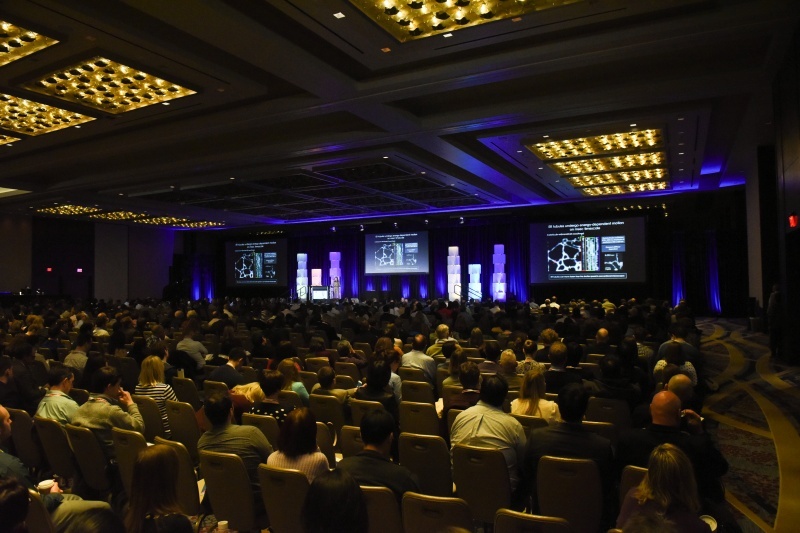 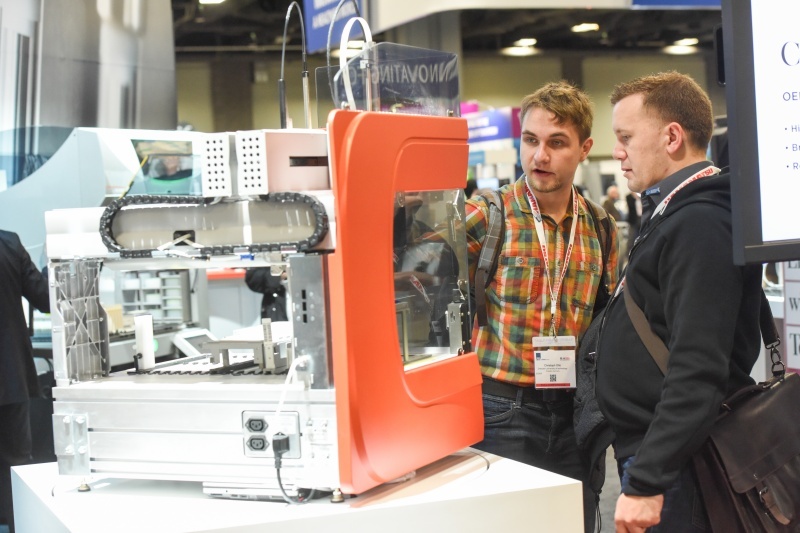 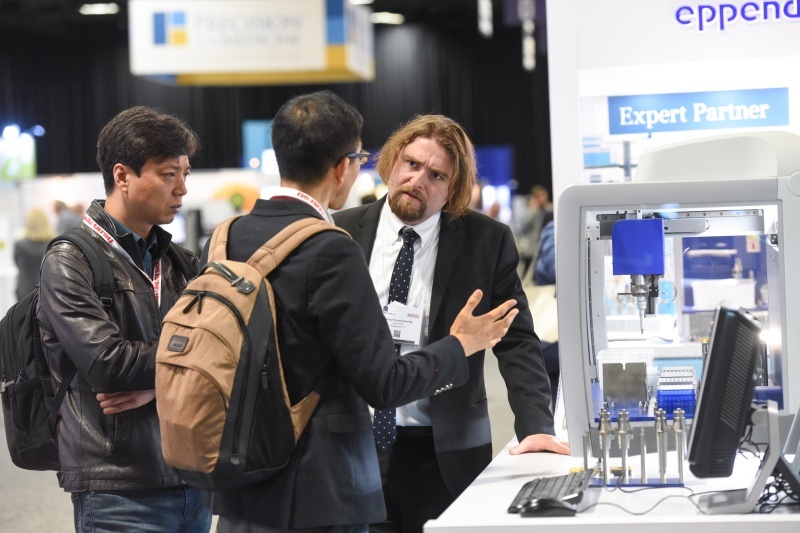 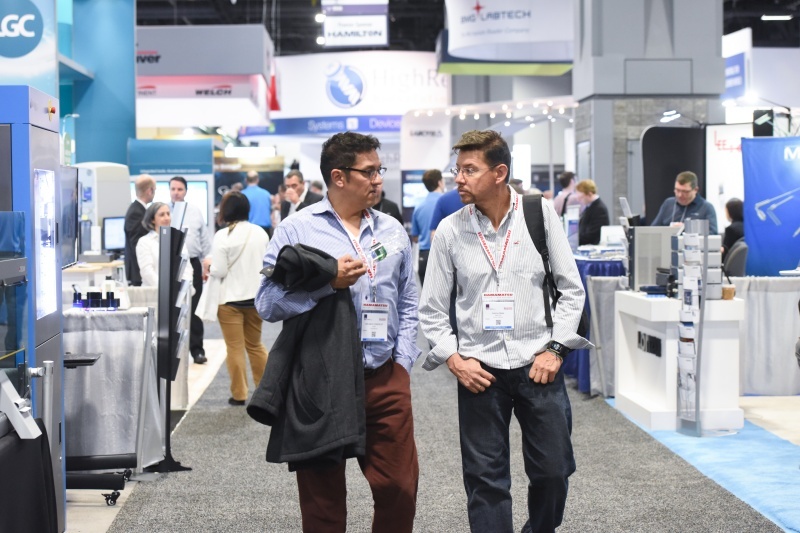 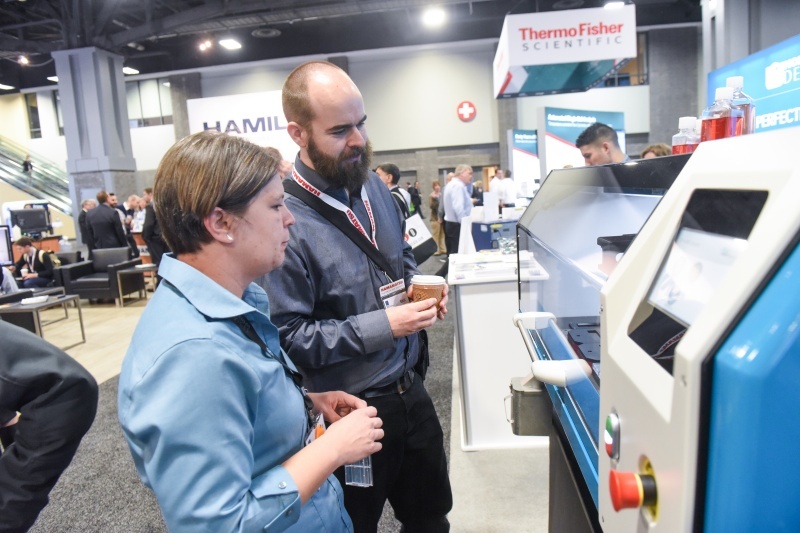 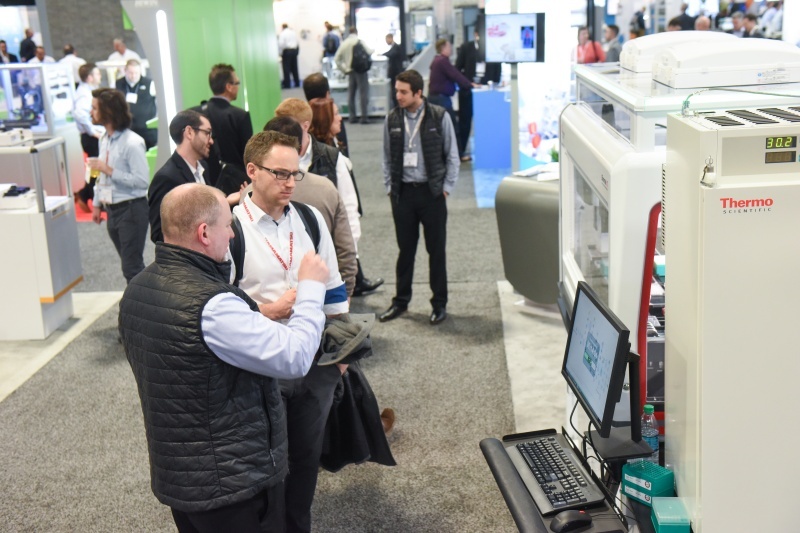 Attendees benefited from a tremendous scientific program, an expansive exhibition of life sciences innovations, and plentiful professional networking opportunities. 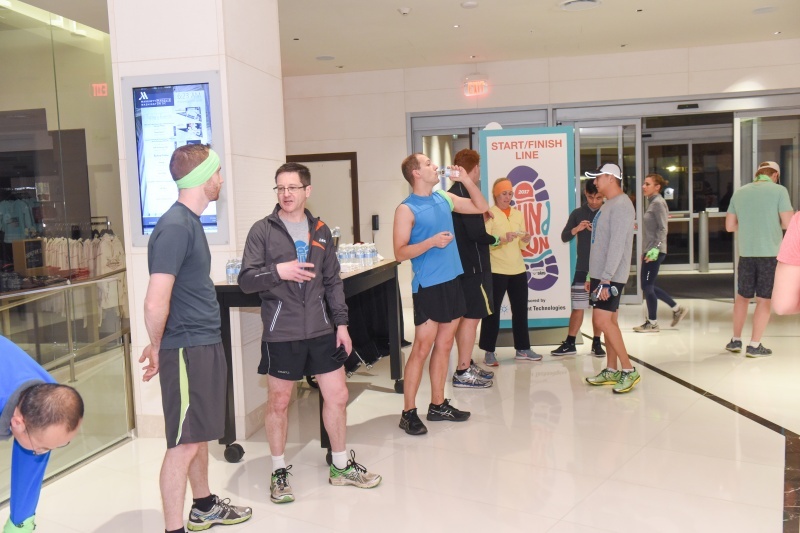 Enjoy this photo review of the event. 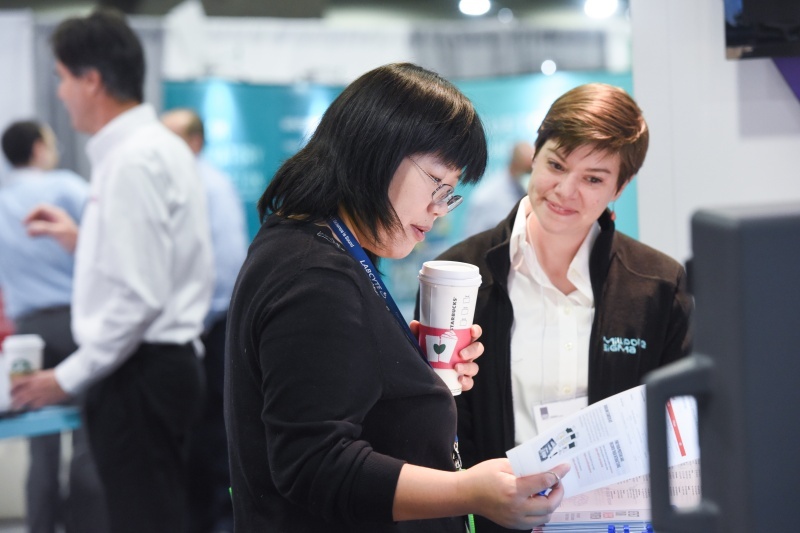 To be part of the SLAS community, join us at SLAS2018, taking place February 3-7 at the San Diego Convention Center in San Diego, California, USA. 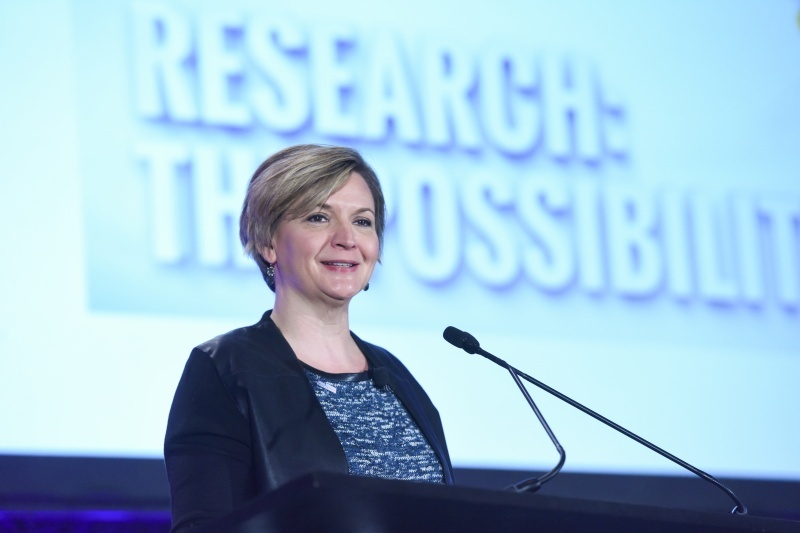 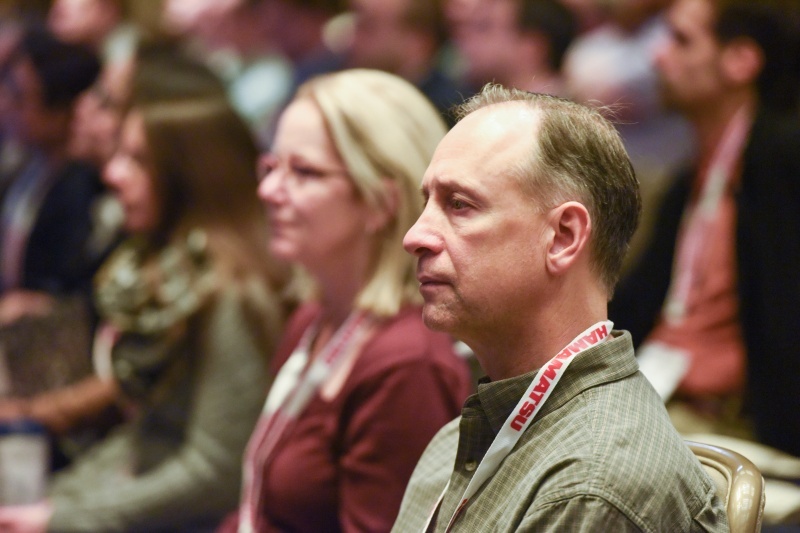 On Feb. 6, the opening session officially kicked off the core conference program in style. 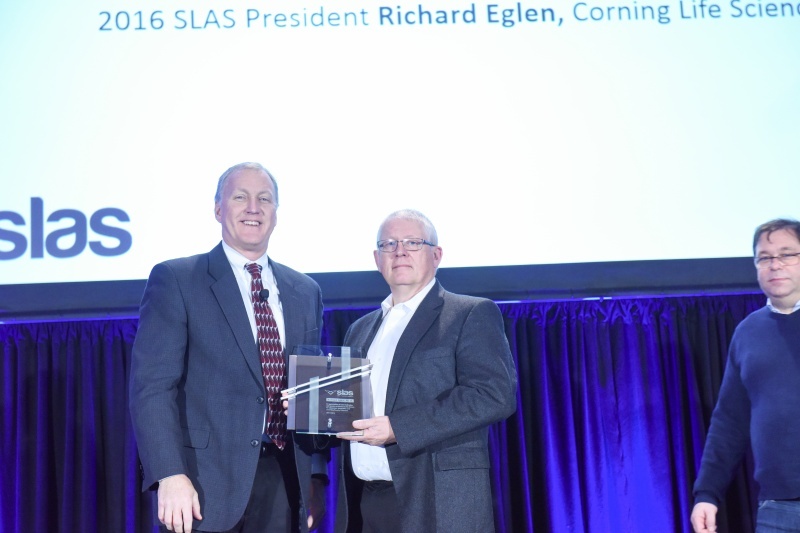 2017 SLAS President Scott Atkin welcomed attendees by touting the open and inclusive spirit of the SLAS community. 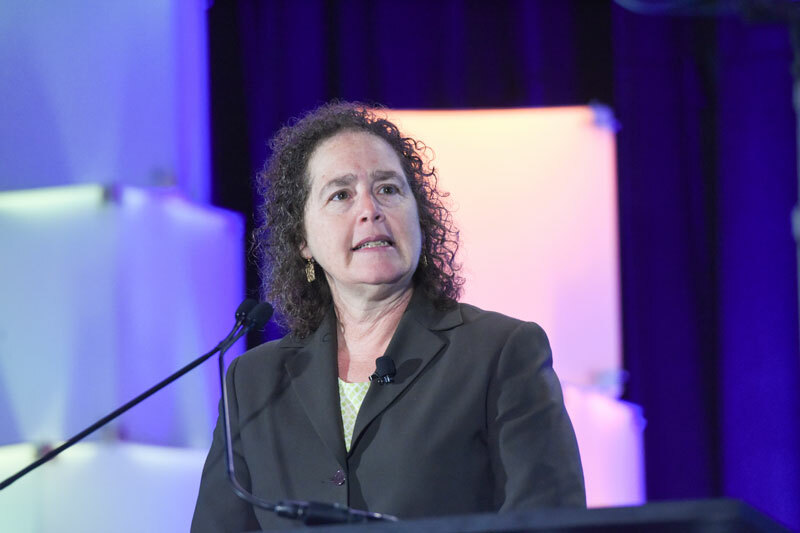 New SLAS Chief Executive Officer introduced herself to the Society’s membership by announcing the new SLAS Strategic Plan. 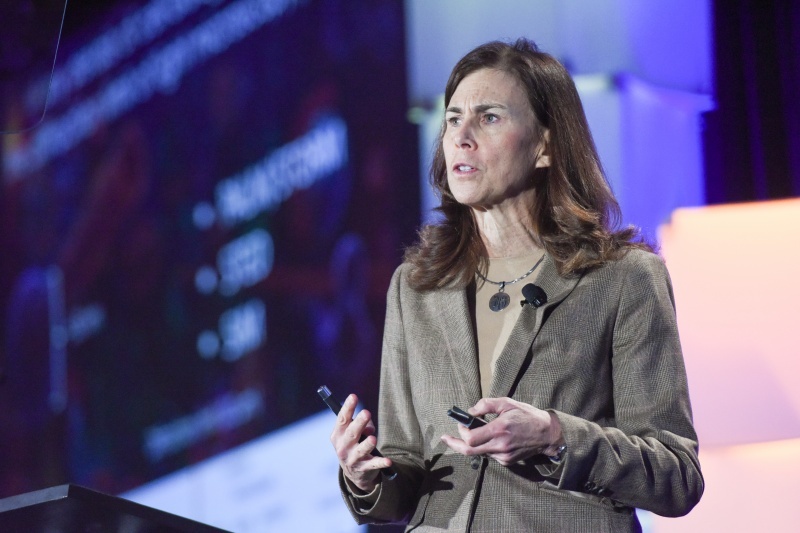 Following opening announcements, Conference Co-Chair Marcie Glicksman introduced keynote speaker Jennifer Lippincott-Schwartz, Group Leader at the Howard Hughes Medical Research Center. 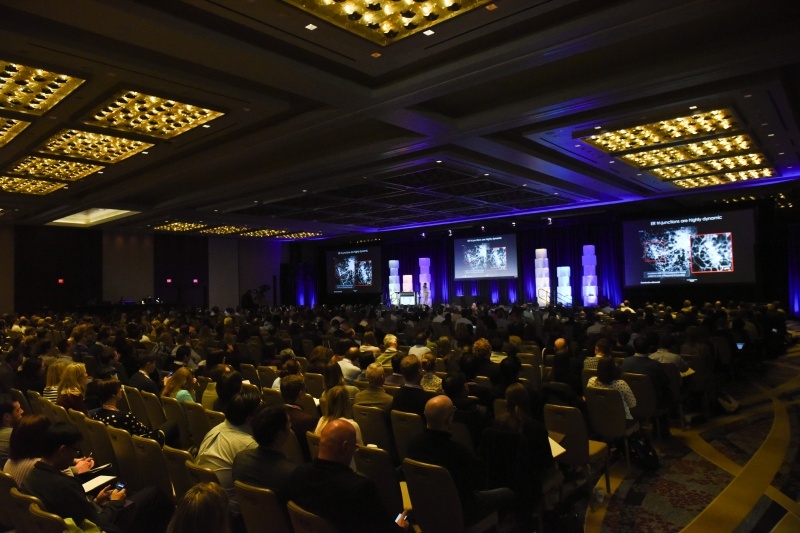 Stream Dr. Lippincott’s opening keynote. 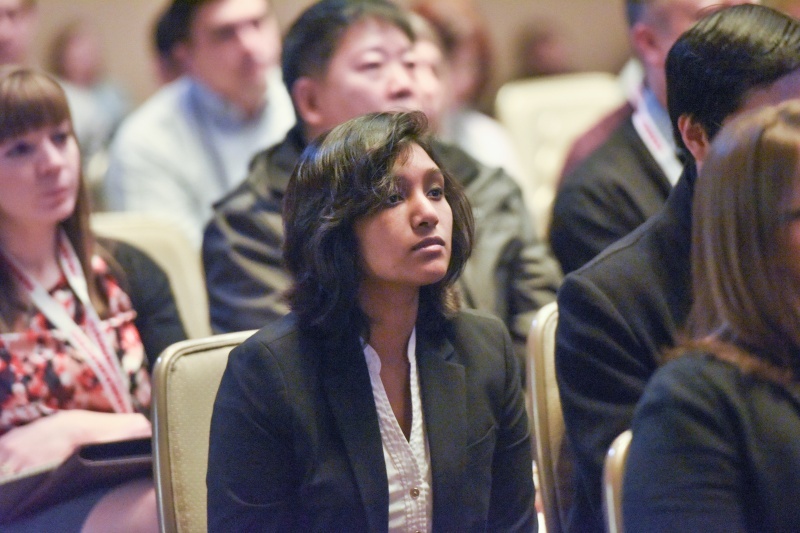 New SLAS Chief Executive Officer introduced herself to the Society’s membership by announcing the new SLAS Strategic Plan. 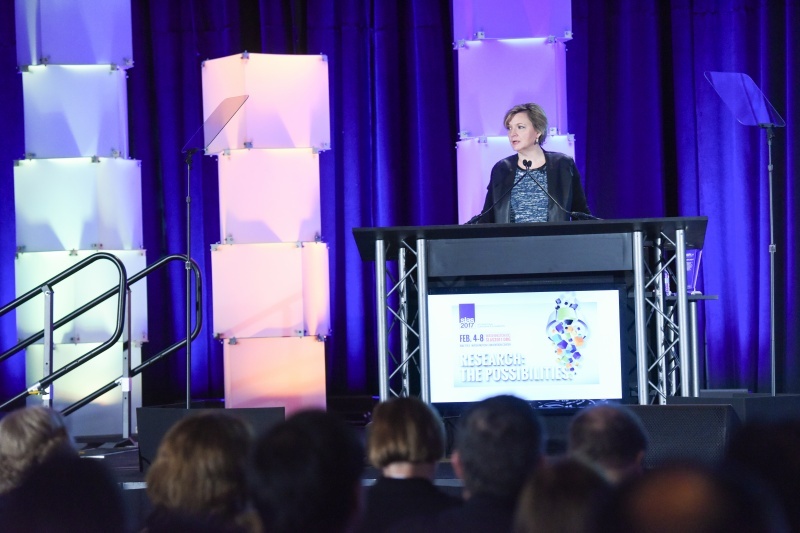 Following opening announcements, Conference Co-Chair Marcie Glicksman introduced keynote speaker Jennifer Lippincott-Schwartz, Group Leader at the Howard Hughes Medical Research Center. 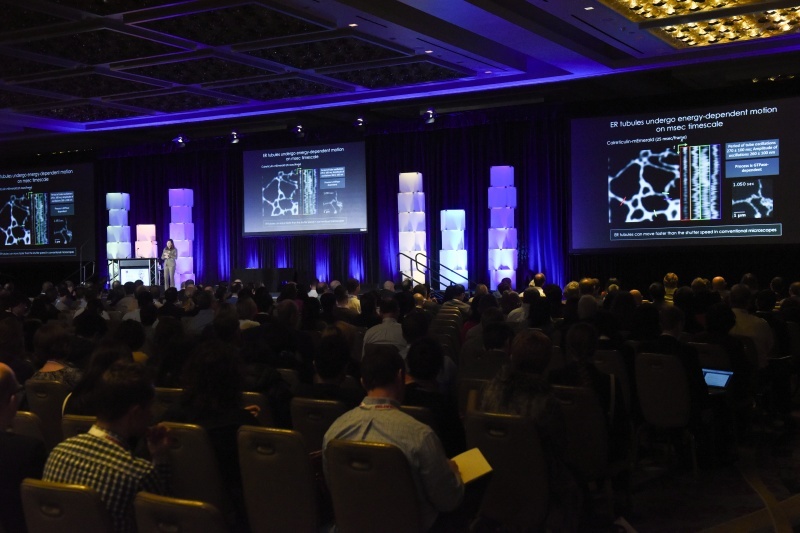 Stream Dr. Lippincott’s opening keynote. 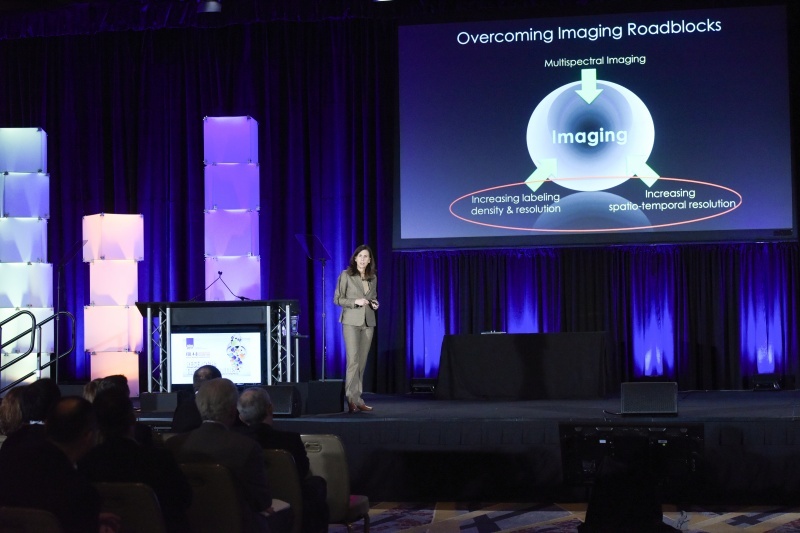 Nine podium presentations were selected as finalists for the 2017 SLAS Innovation Award. 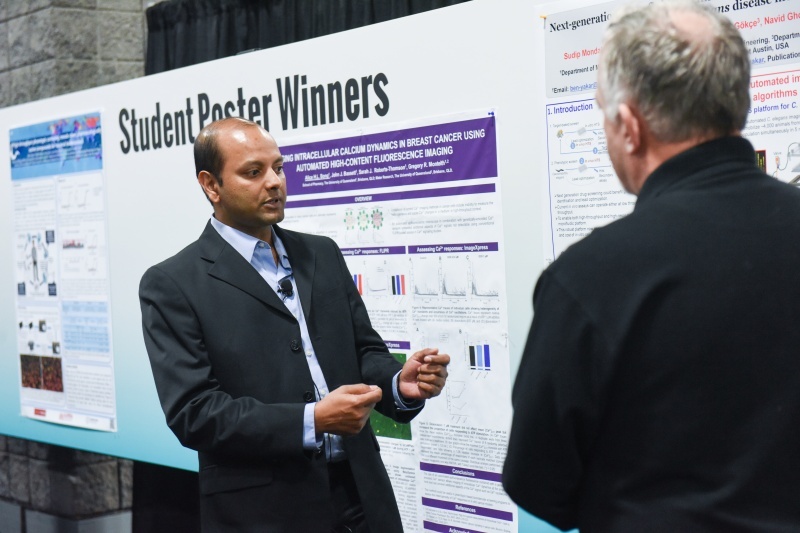 The final round of judging took place during SLAS2017, when all presentations were evaluated by the judging panel using a specific set of criteria. 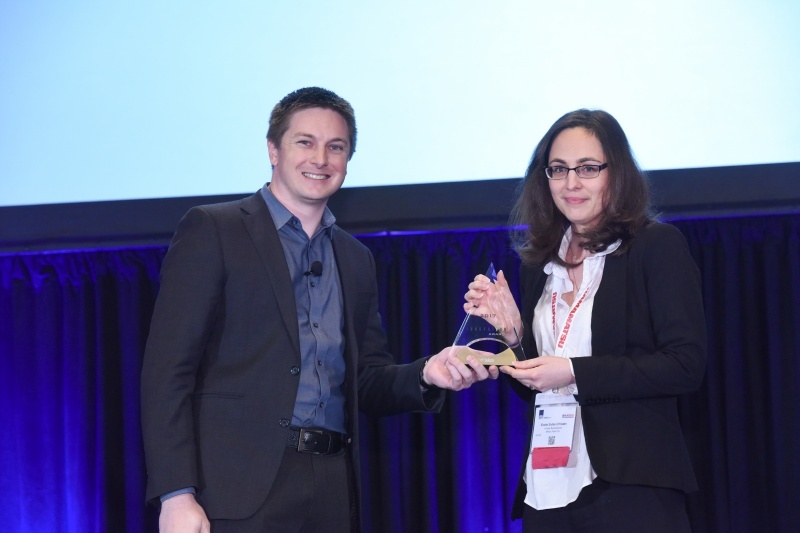 Following deliberations at the conference, Elodie Sollier-Christen, Vortex Biosciences, Inc. was selected as the 2017 Innovation Award Winner for her presentation, Vortex Biosciences Technology for Fast and Label-Free Isolation of Circulating Tumor Cells from Blood Samples. 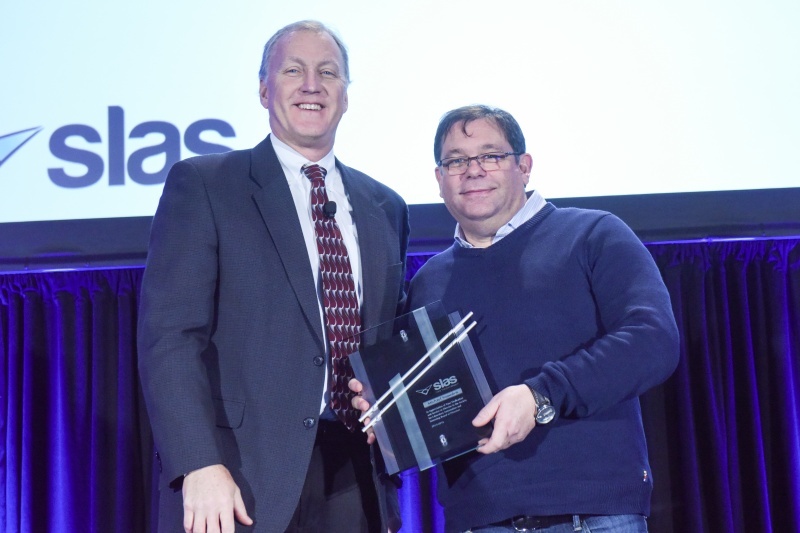 Dr. Sollier-Christen’s award-winning presentation is available on demand in the SLAS Webinar Archive. 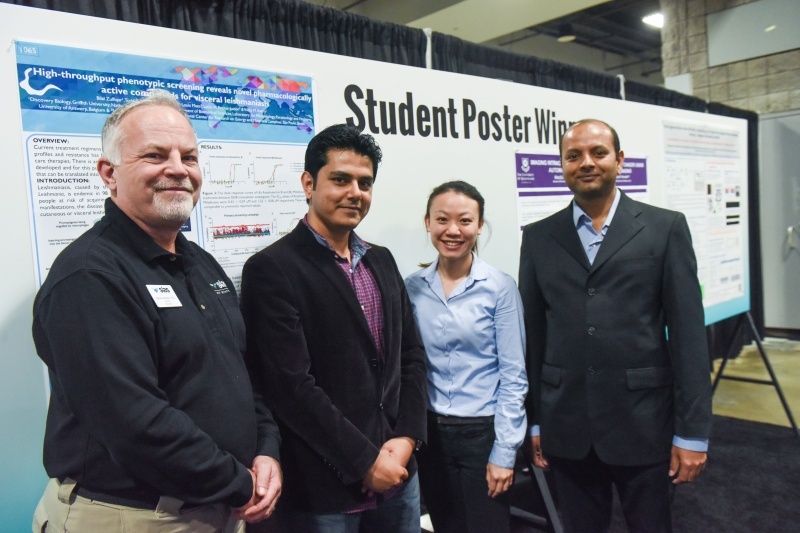 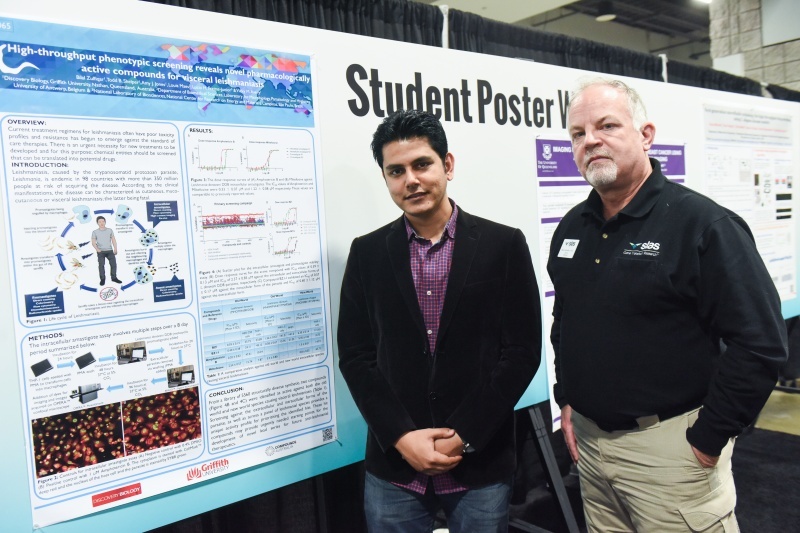 Student poster winners at SLAS2017 included (pictured left-to-right): SLAS Director Education Steve Hamilton; Bilal Zulfiqar, Griffith University; Alice Bong, University of Queensland; and Sudip Mondal, University of Texas at Austin. 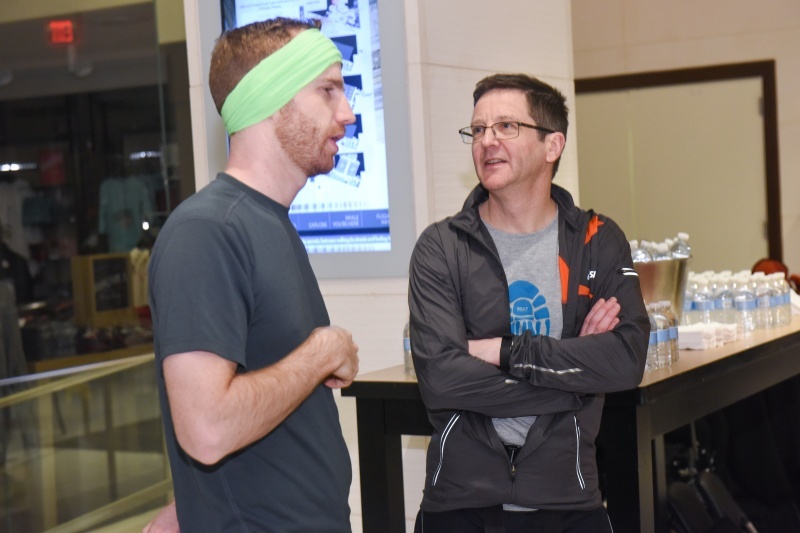 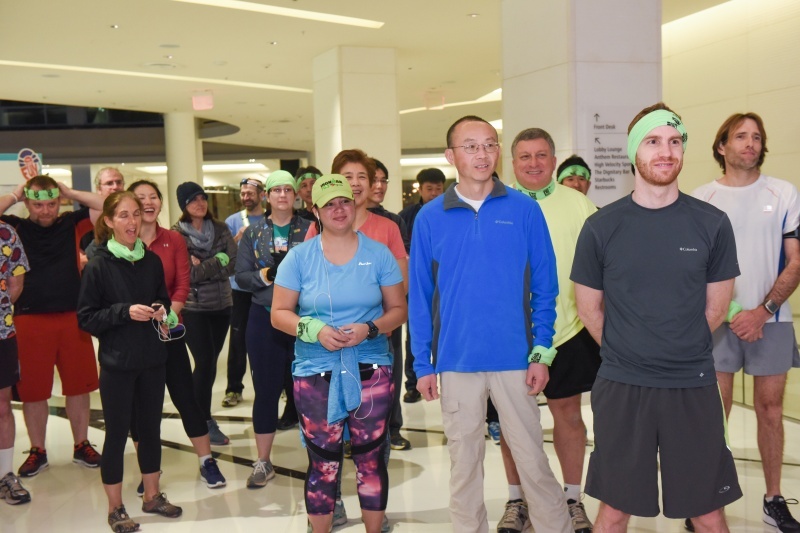 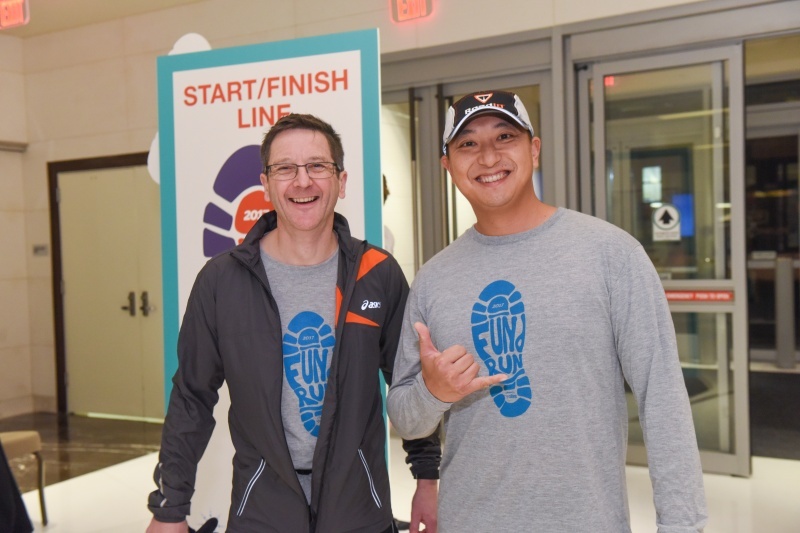 On the morning of Feb. 8, SLAS held its annual FUNd Run benefiting the SLAS Educational Fund. 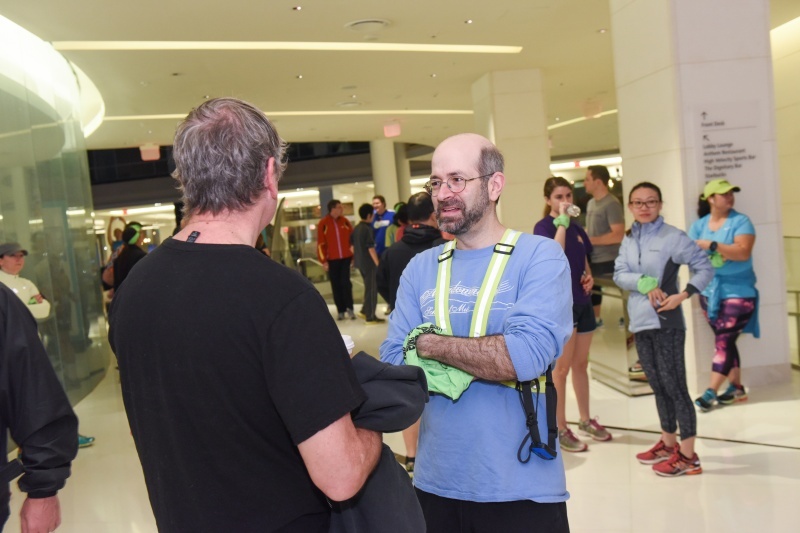 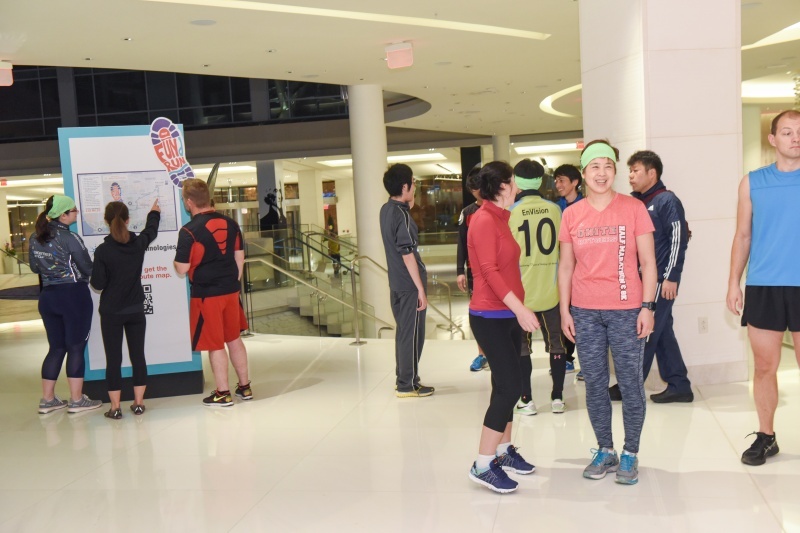 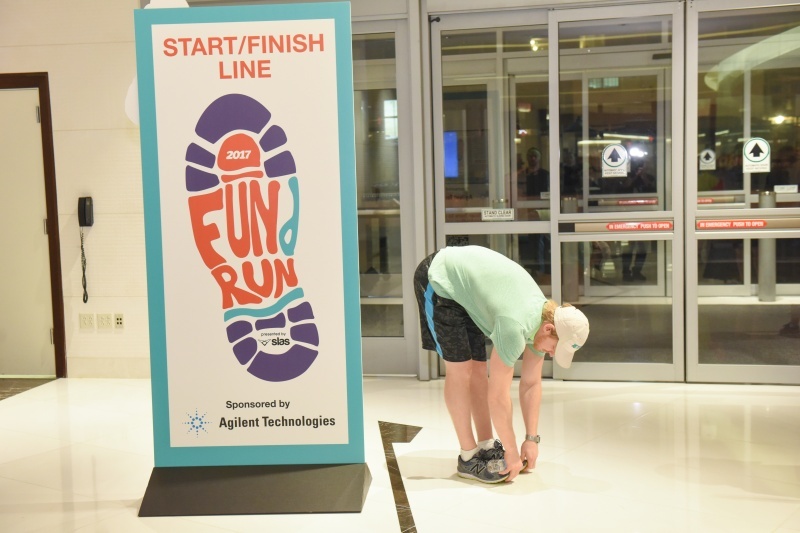 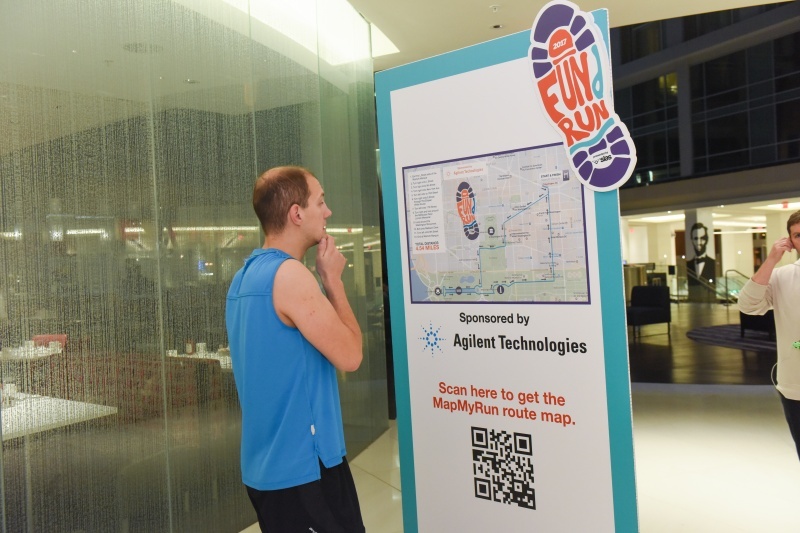 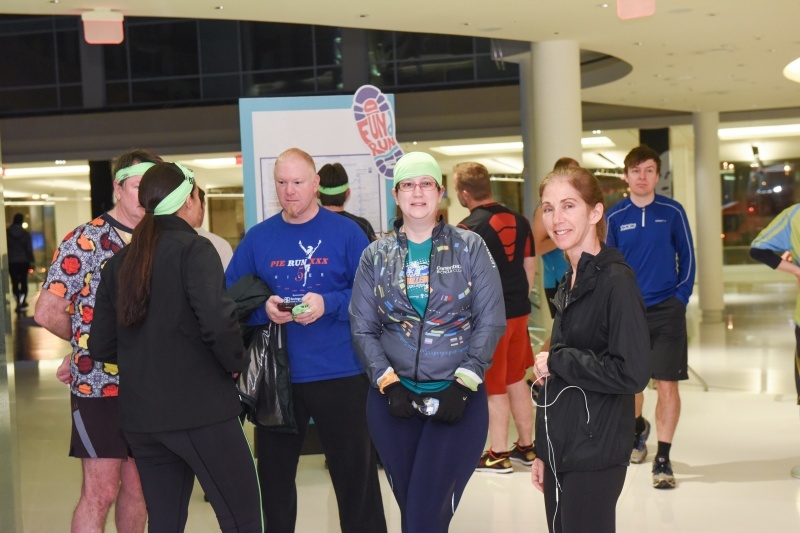 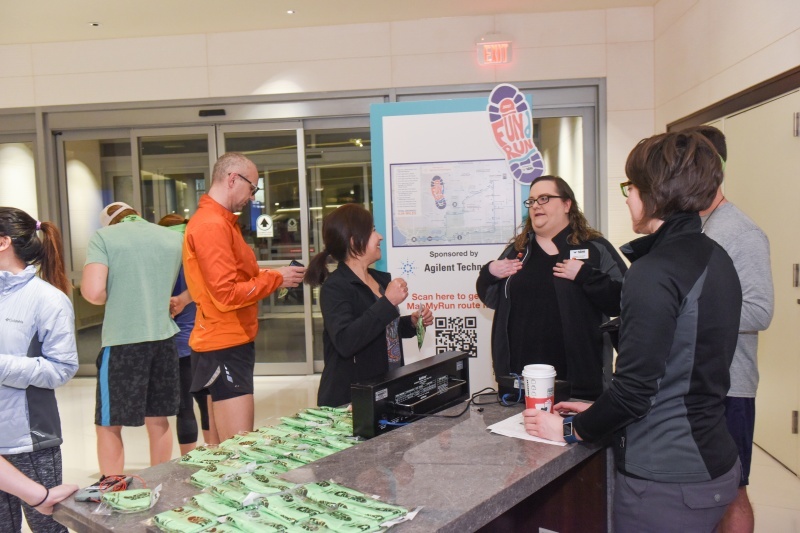 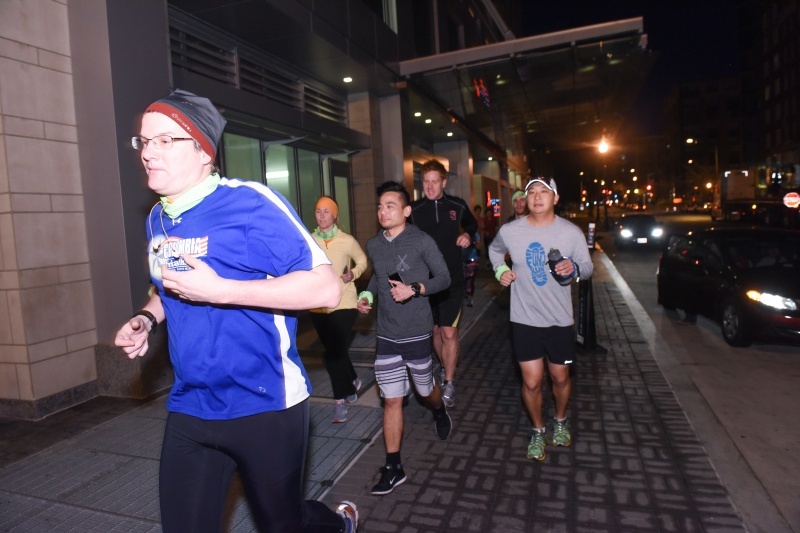 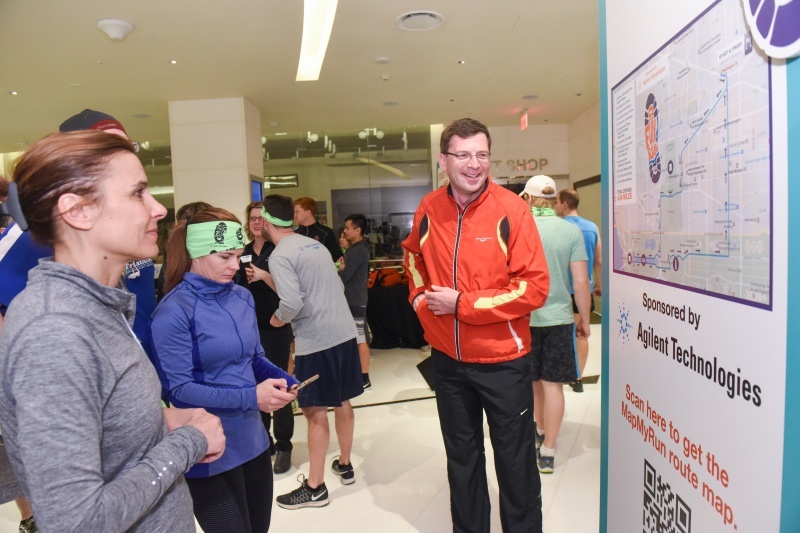 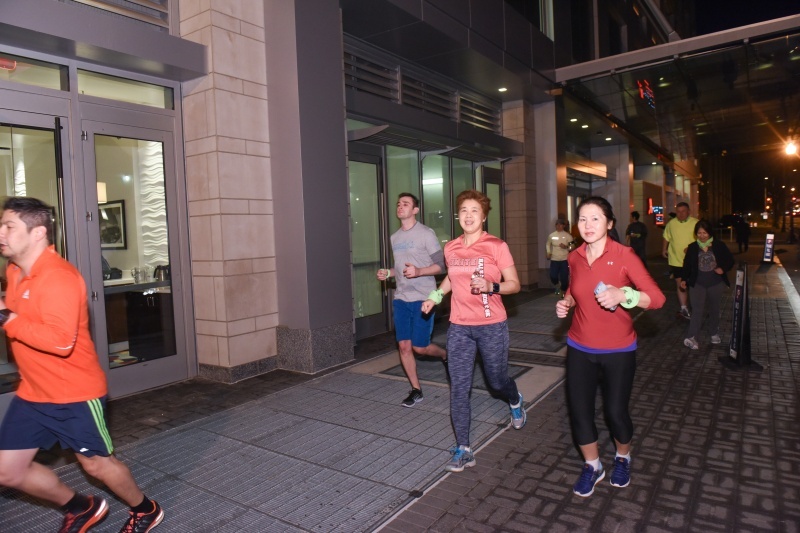 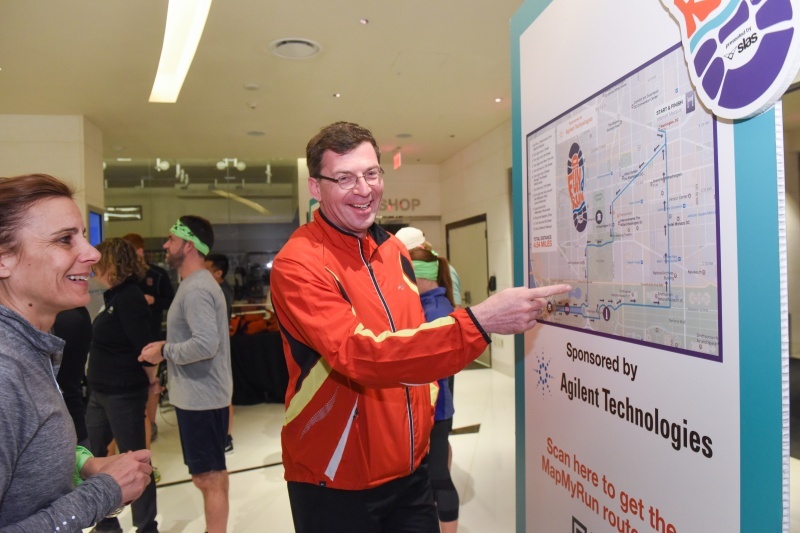 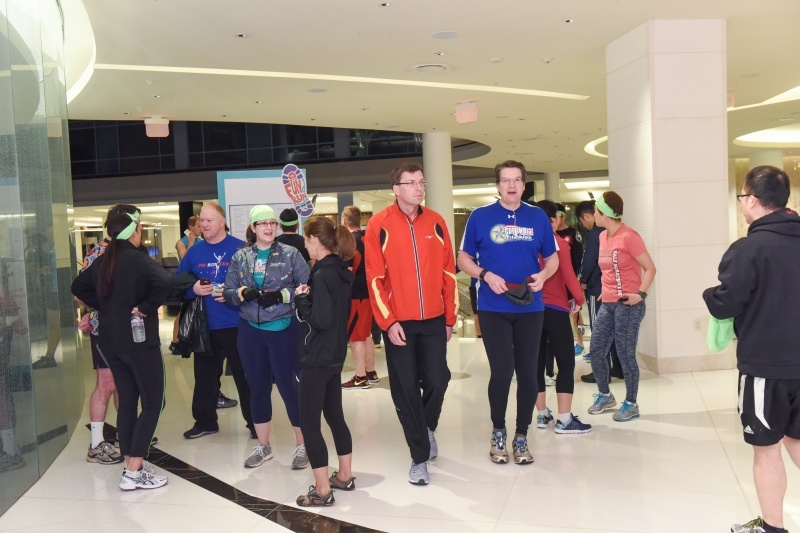 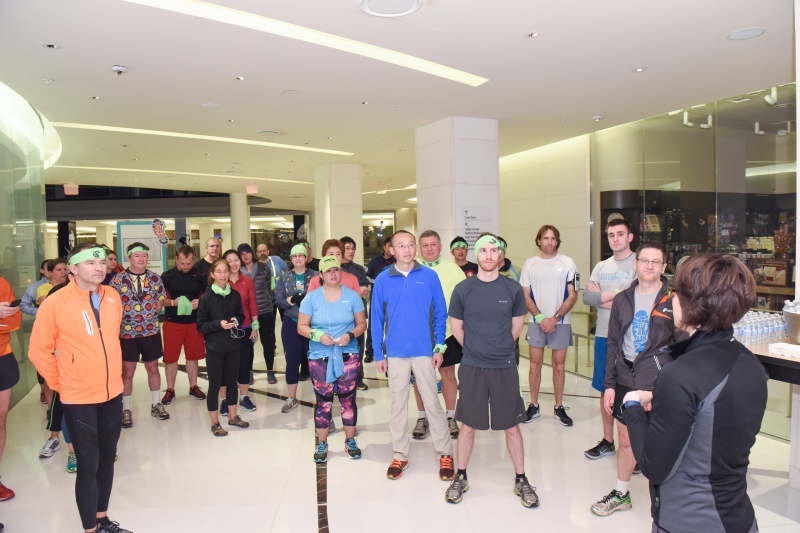 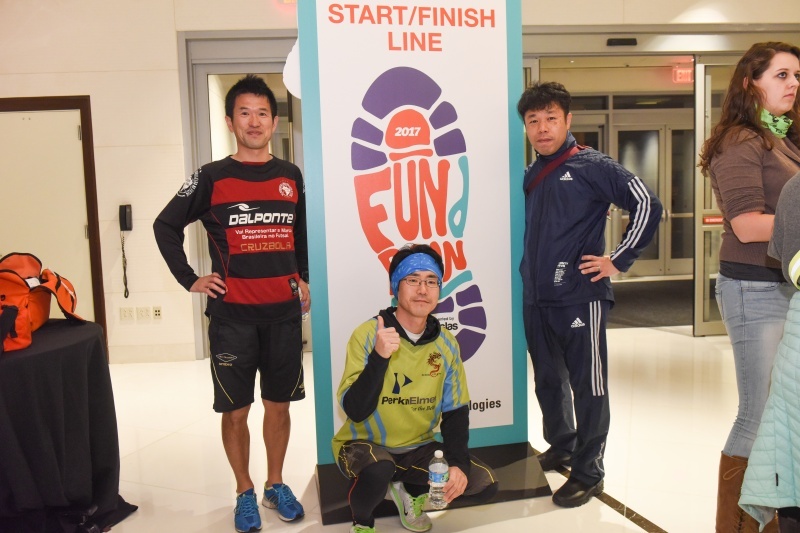 Dozens of attendees convened in the early morning hours to run a scenic 4.5-mile route around and through some of Washington DC’s most renowned landmarks. 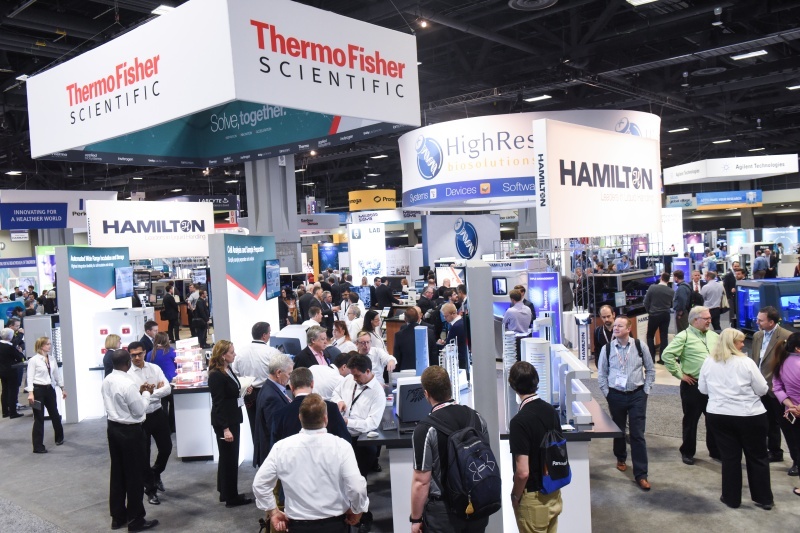 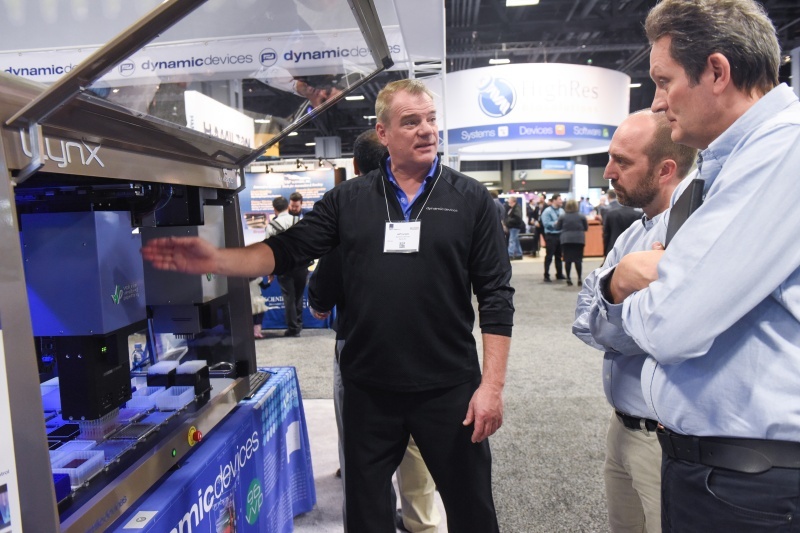 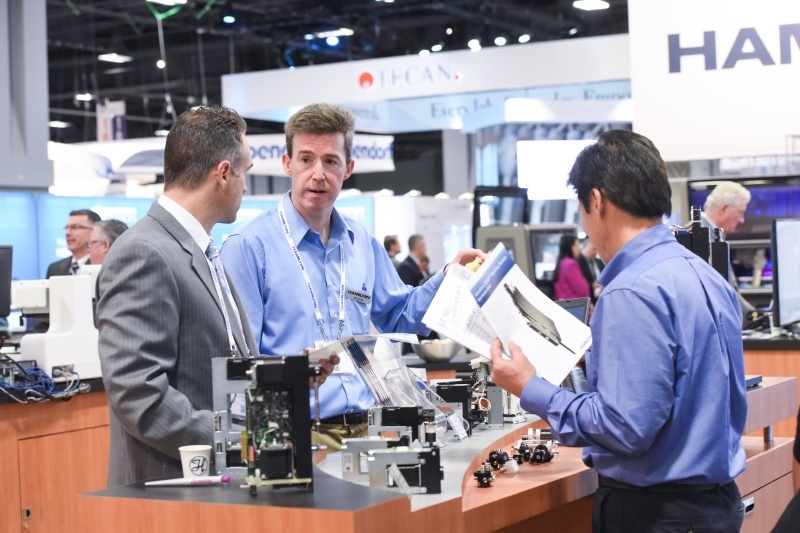 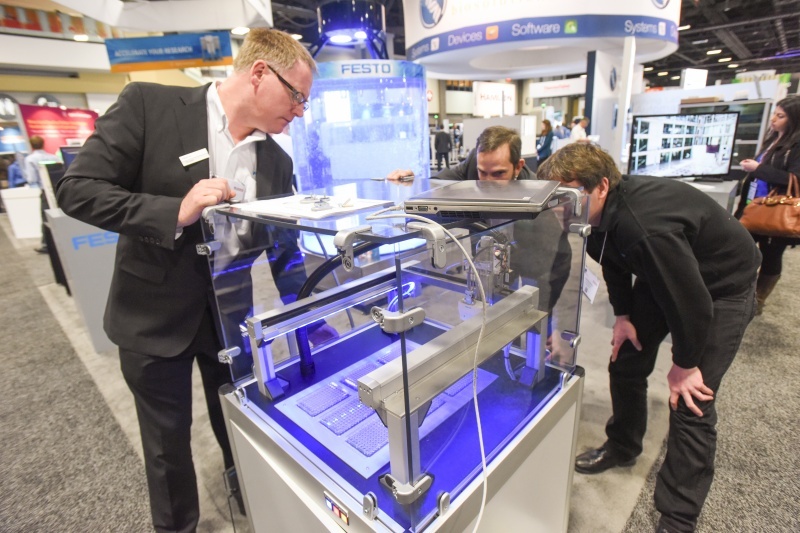 The SLAS2017 Exhibition featured 305 multinational companies showcasing the latest in life sciences discovery and technology products, services and innovation. 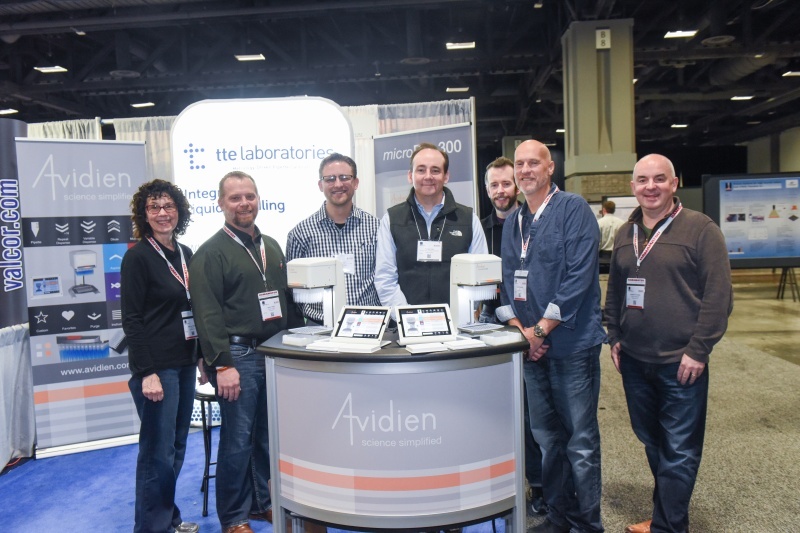 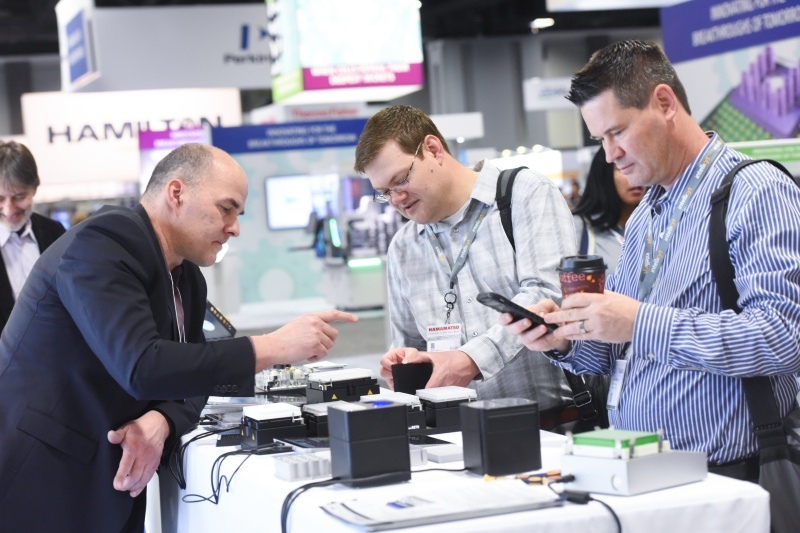 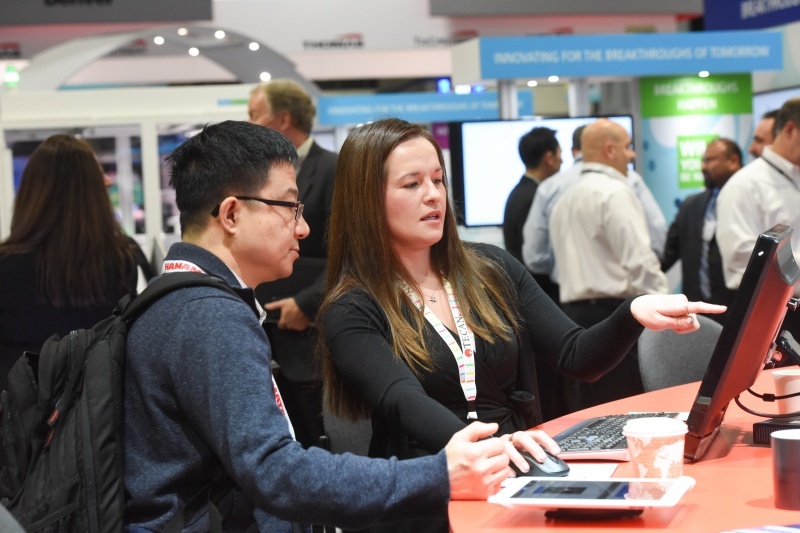 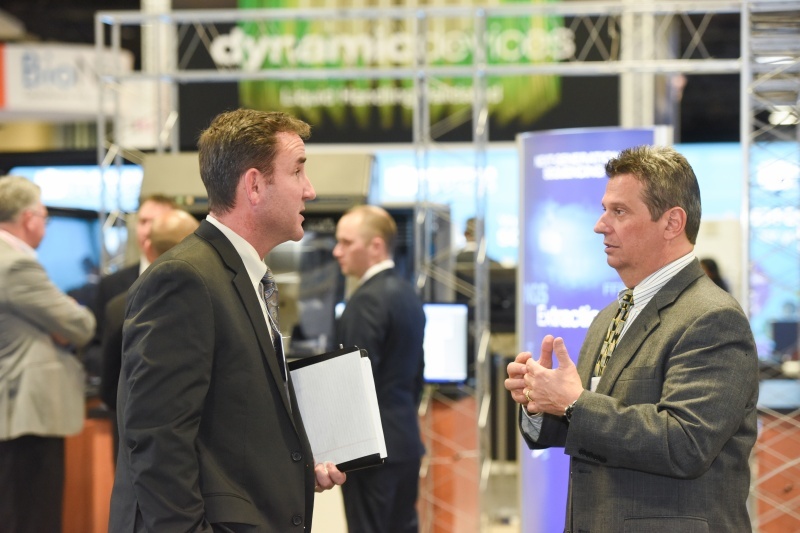 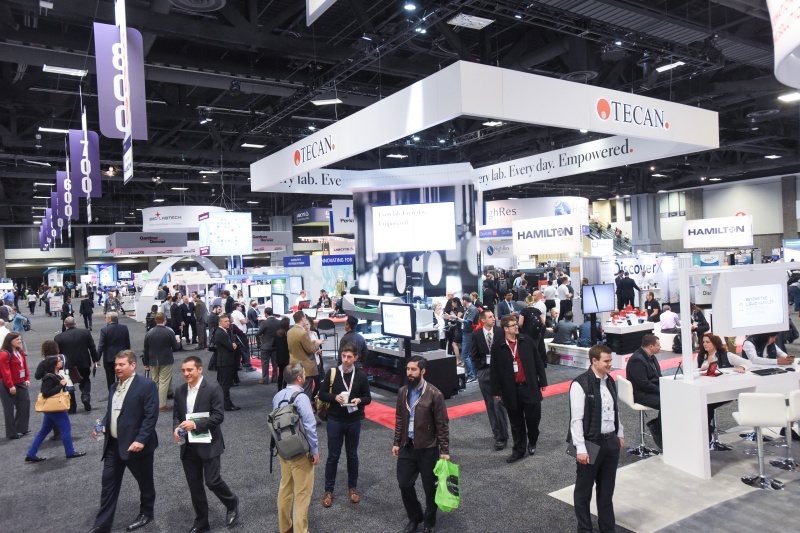 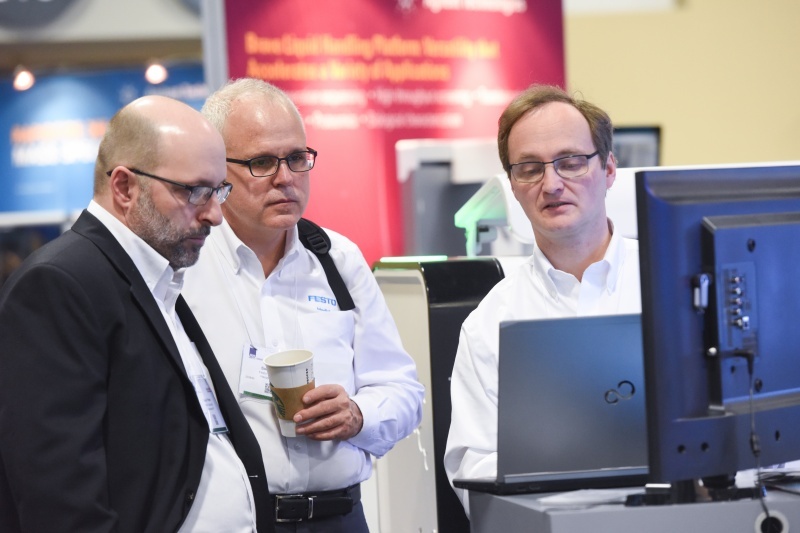 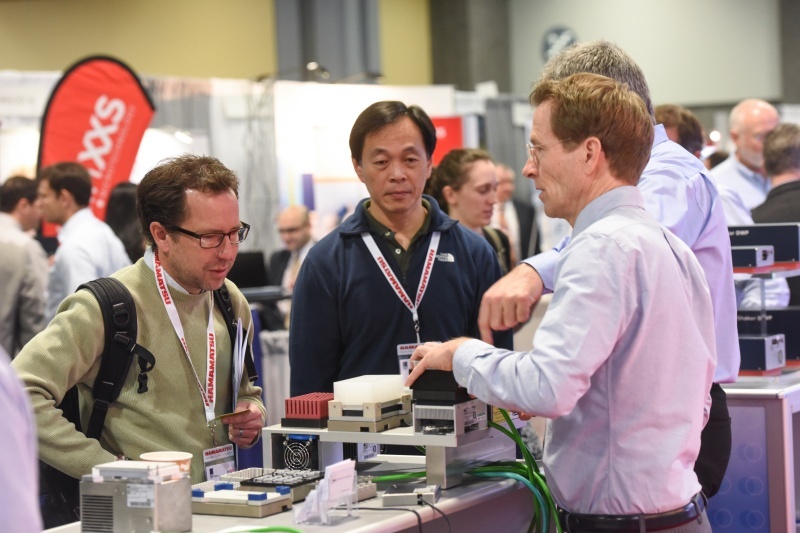 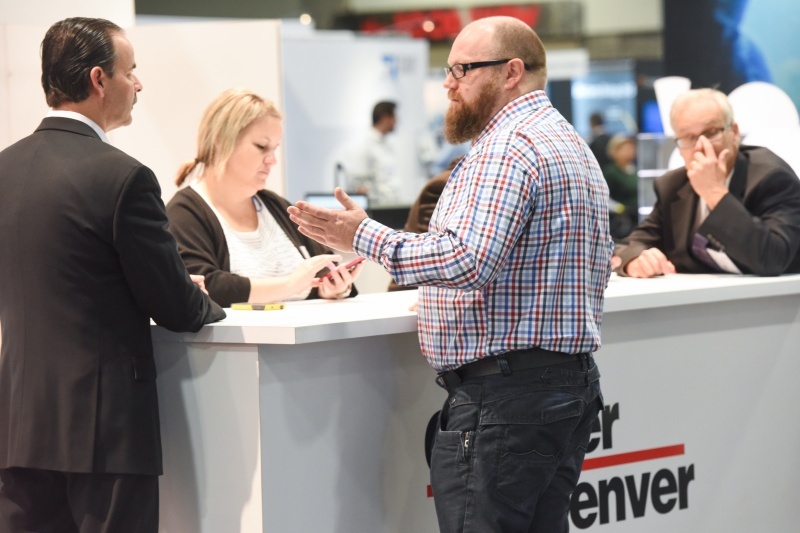 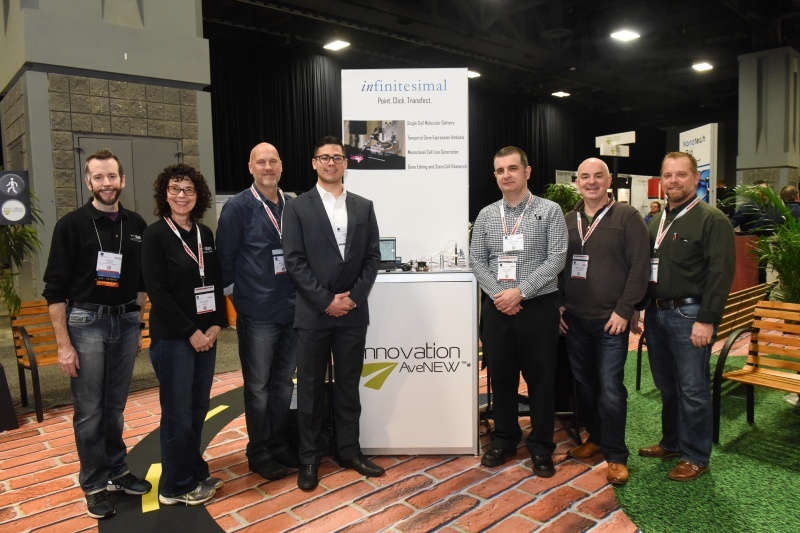 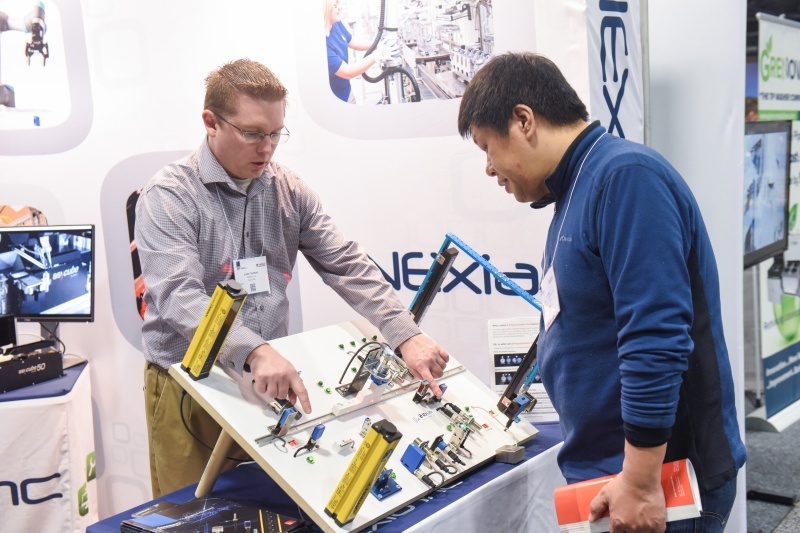 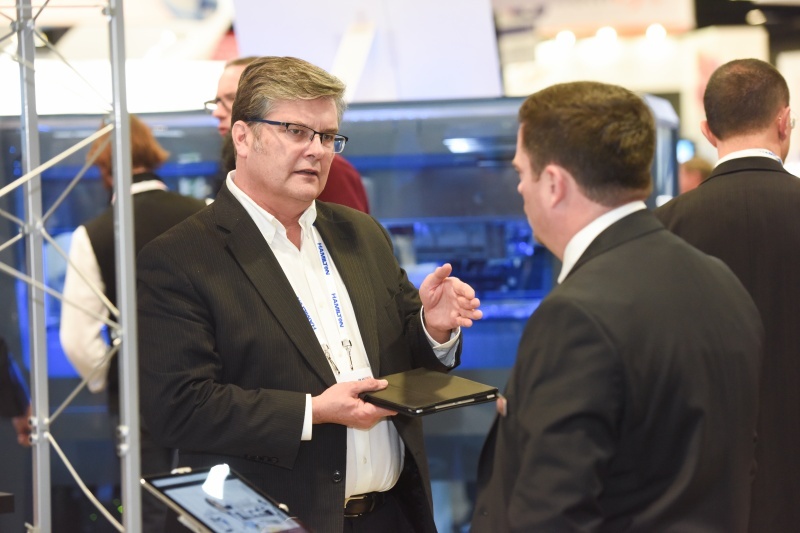 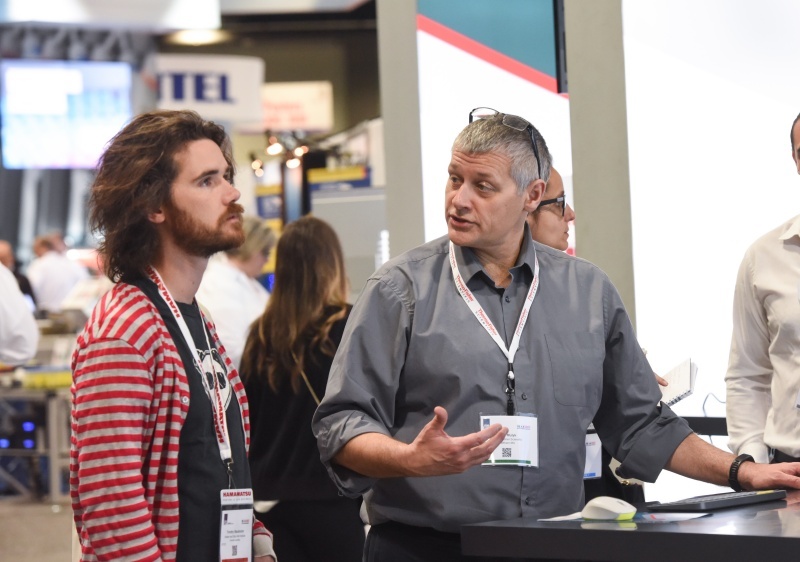 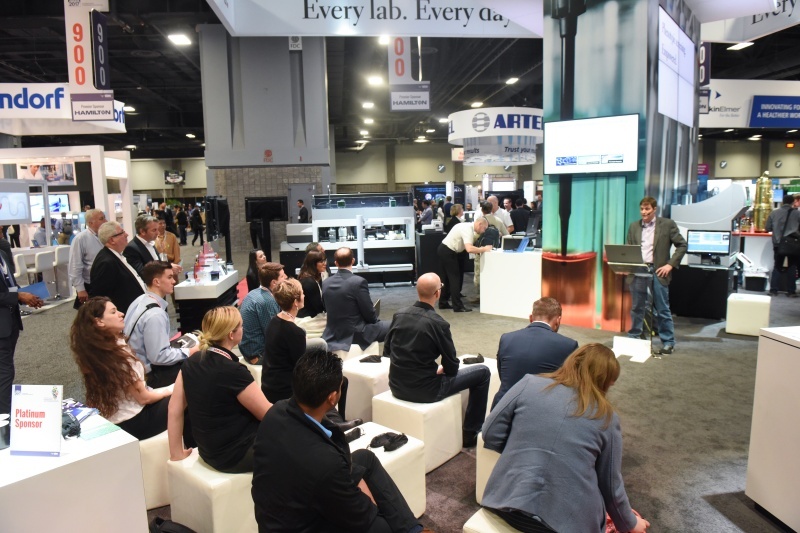 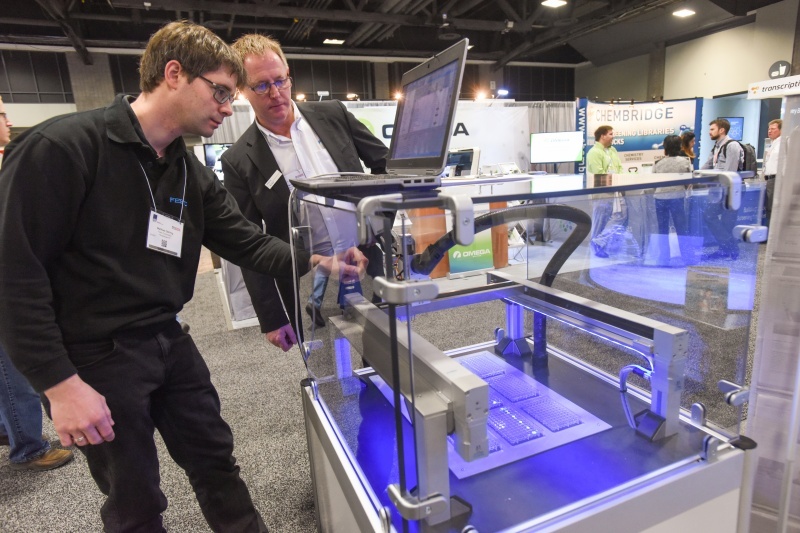 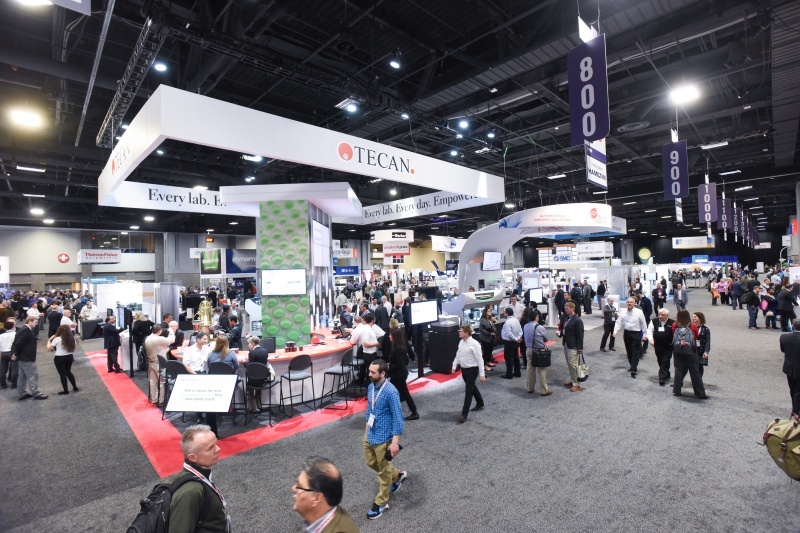 The SLAS2017 Exhibition featured in-booth demonstrations, exhibitor tutorials, daily receptions, the SLAS Member Center, and SLAS Innovation AveNEW, which hosted a series of start-up and nascent companies receiving special attention and visibility courtesy of SLAS. 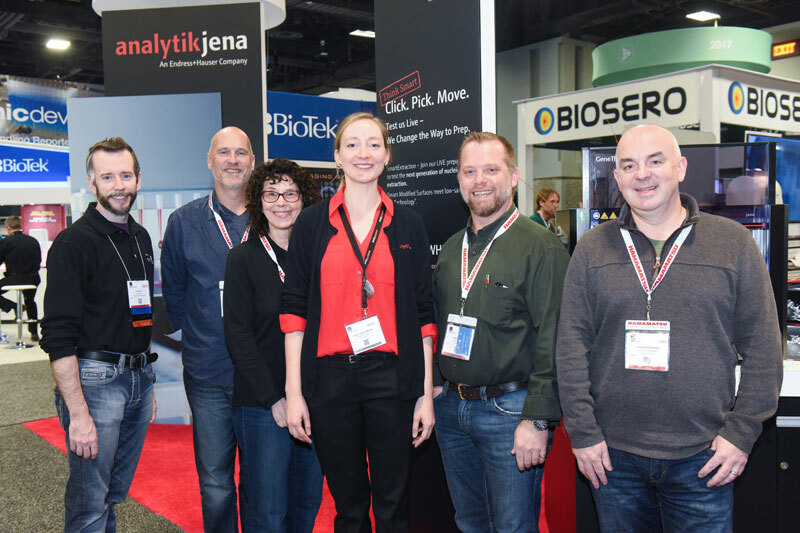 369 scientific posters were presented at SLAS2017, and many poster authors took advantage of the opportunity to discuss their research with fellow attendees. 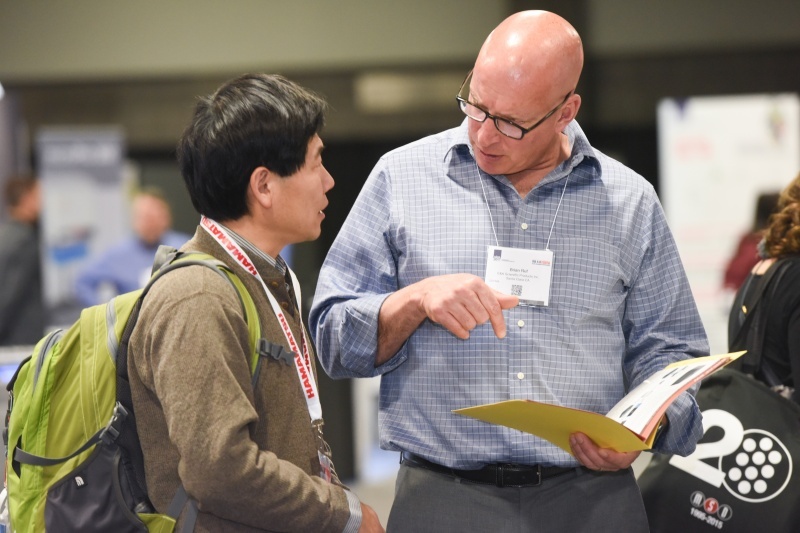 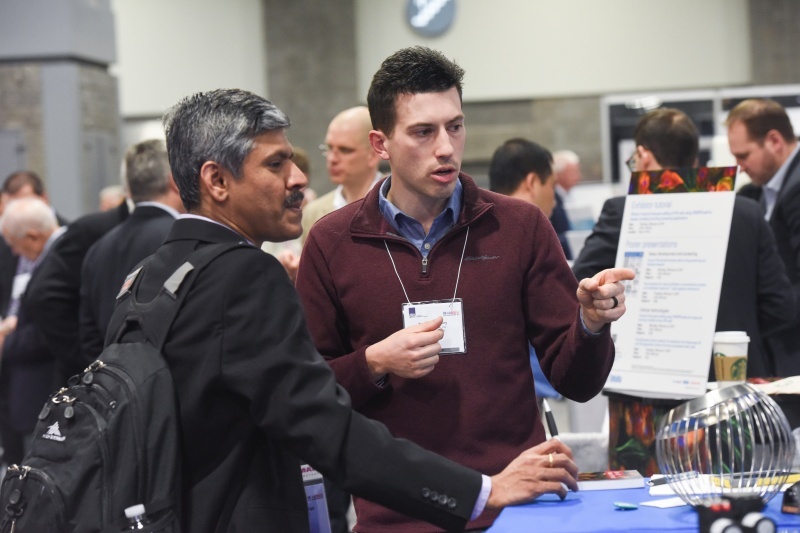 Valuable exchanges between poster authors and attendees is a hallmark of SLAS events. 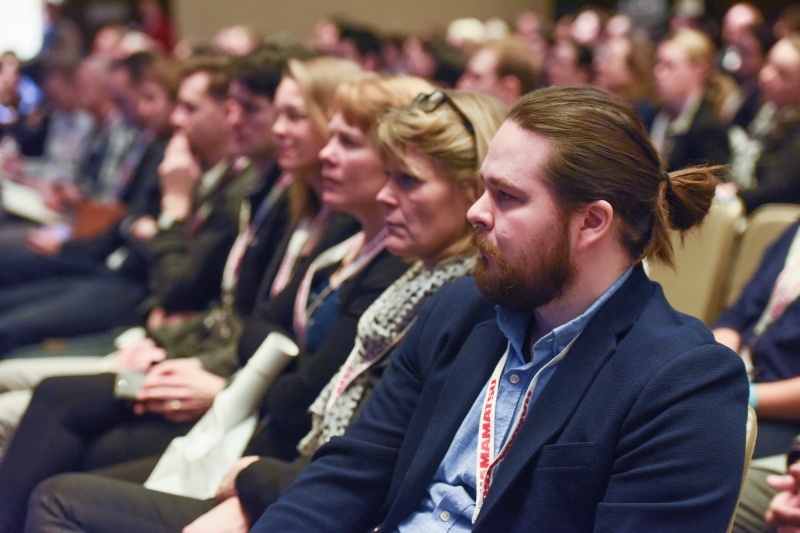 The final evening of SLAS2017 was highlighted by the annual Tuesday Evening All-Attendee Reception, this year hosted at the Newseum. 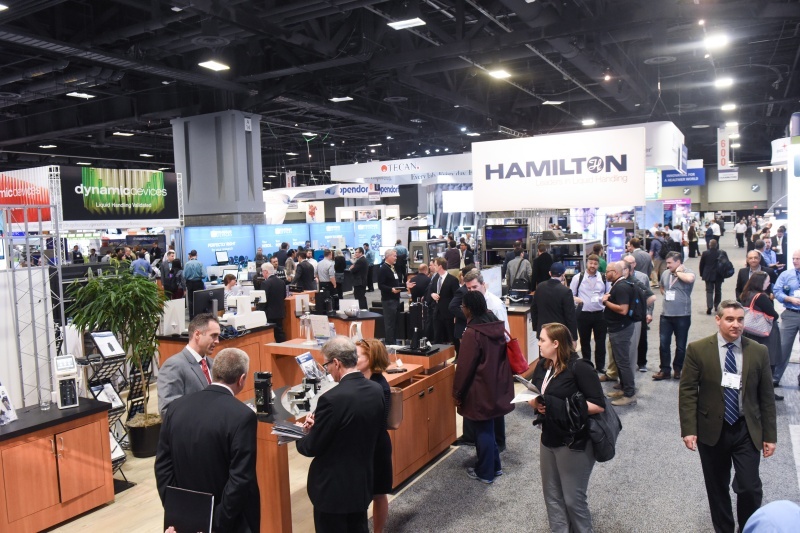 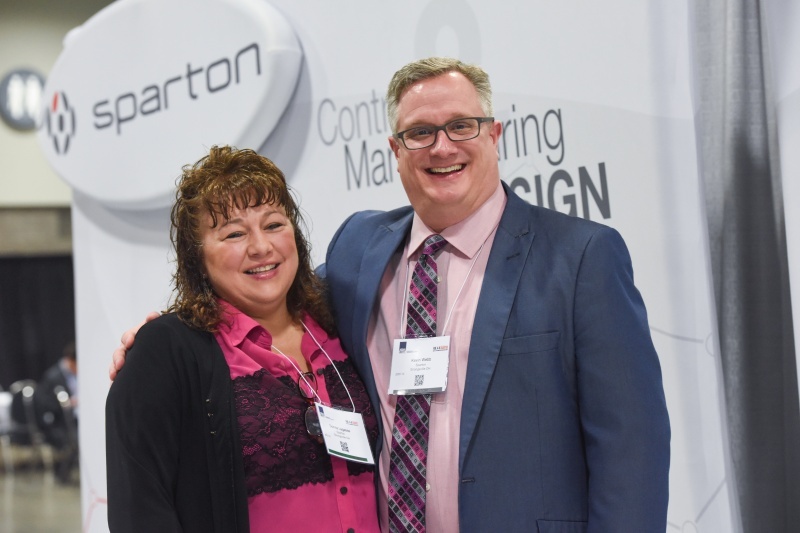 Sponsored by Hamilton Company, attendees were treated to exclusive and open access to the venue’s seven floors of interactive exhibits for three-plus hours. 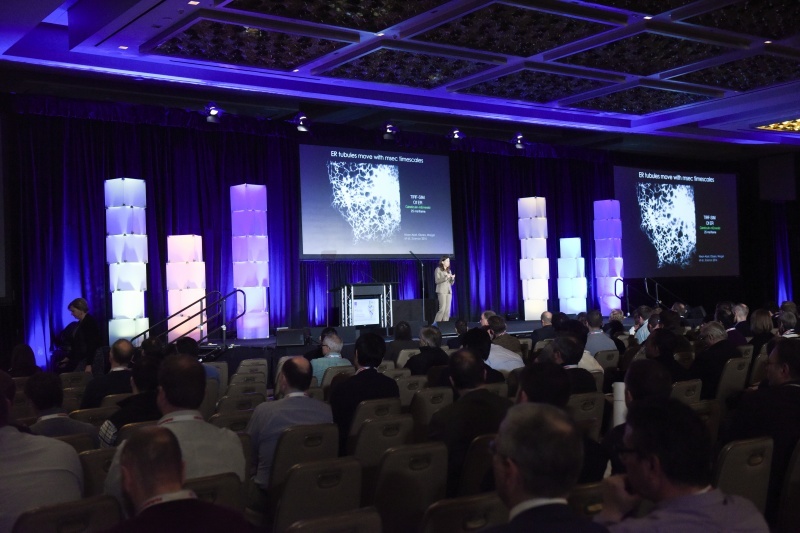 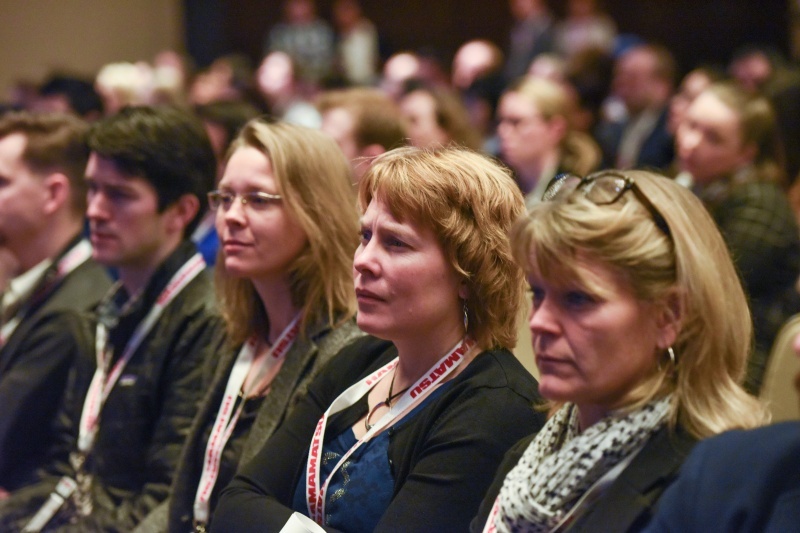 The Closing Session on the afternoon on Feb. 8 featured concluding comments from SLAS leaders, a keynote by author Rachel Swaby and the announcement of the 2017 SLAS Innovation Award winner. 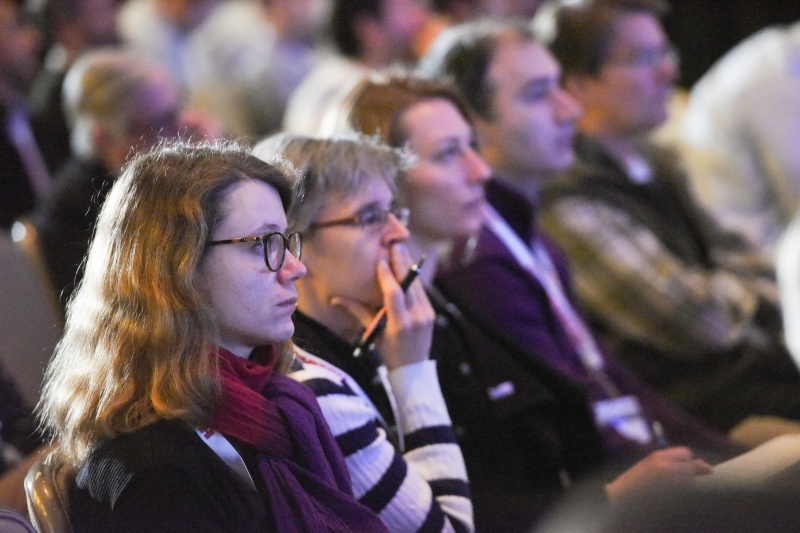 Swaby’s presentation, From the Center of the Earth to the Stars: The Unknown History of Women in Science, enlightened attendees to the stories of several famous female scientific pioneers, highlighting not only their achievements, but the obstacles they overcame in the course of their research. 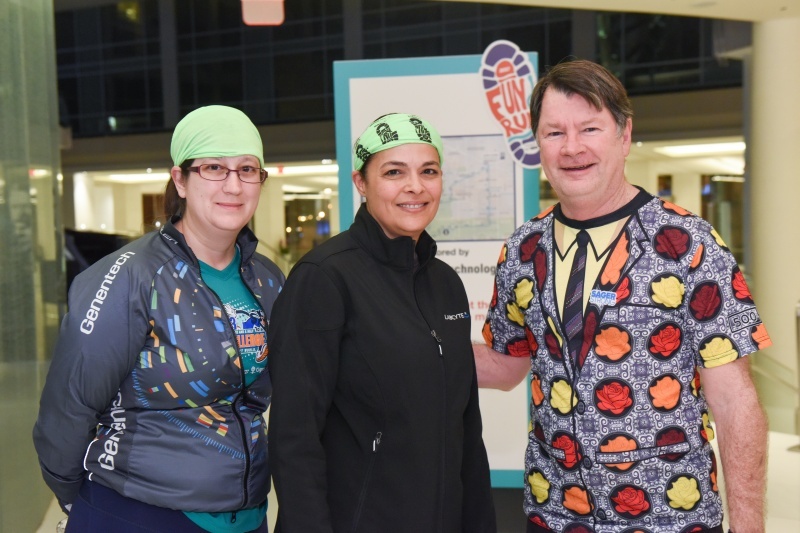 Swaby graciously participated in a book-signing following her presentation.